Before starting our 4-day journey into the wilderness, we decided to stop in Leavenworth to fill up on delicious bratwurst and local beers. And while the food was fantastic, and the beers absolutely delicious, we had to pry ourselves from the beer garden and get under way. 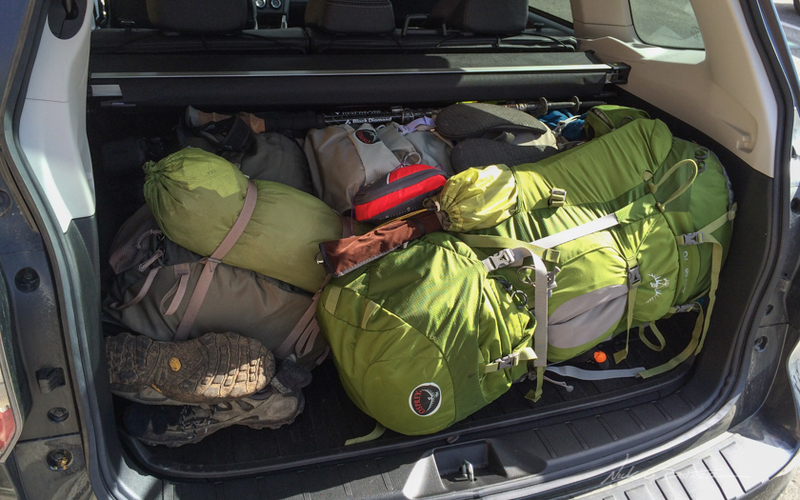 Loaded down with three packs and ready for an adventure. 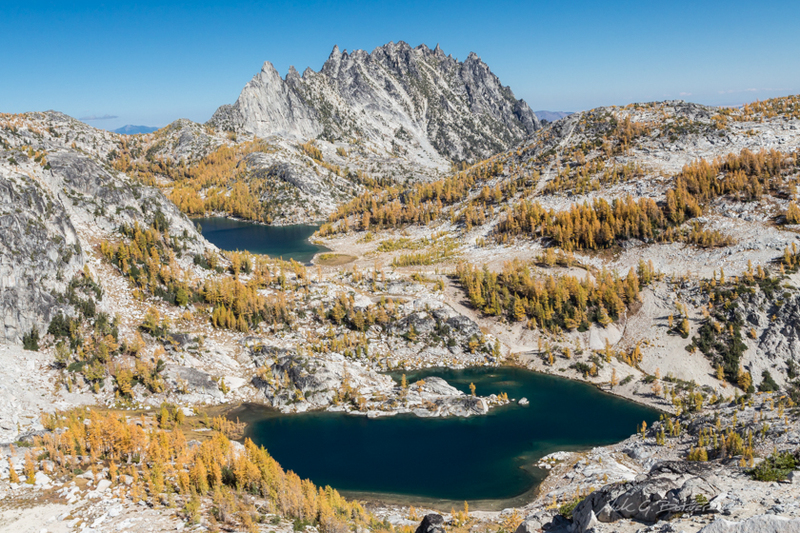 Our point of ingress this time was from the Snow Lakes trailhead. A much more welcome (closer) trailhead than the previous one for Stuart Lake. This alone cut our driving time down by 30 minutes. 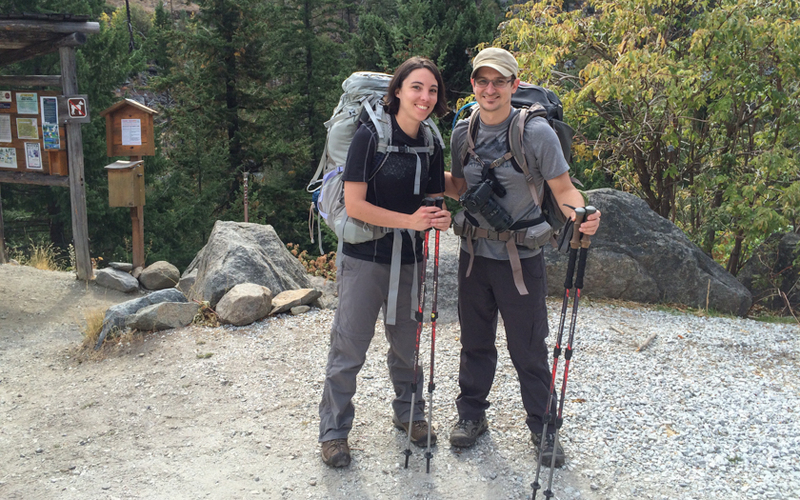 Once at the trailhead we changed into our hiking clothes, said goodbye to our cotton garments. And adjusted our hiking poles for maximum poking. Jen and I are ready for action. Just waiting for Florida man to get his gear together. Originally I tried out several ways to stow my camera on my person. But everything I came up with was just too uncomfortable (see above). So I ended up stowing the camera in my backpack and if needed, I would have my phone to take backup photos. 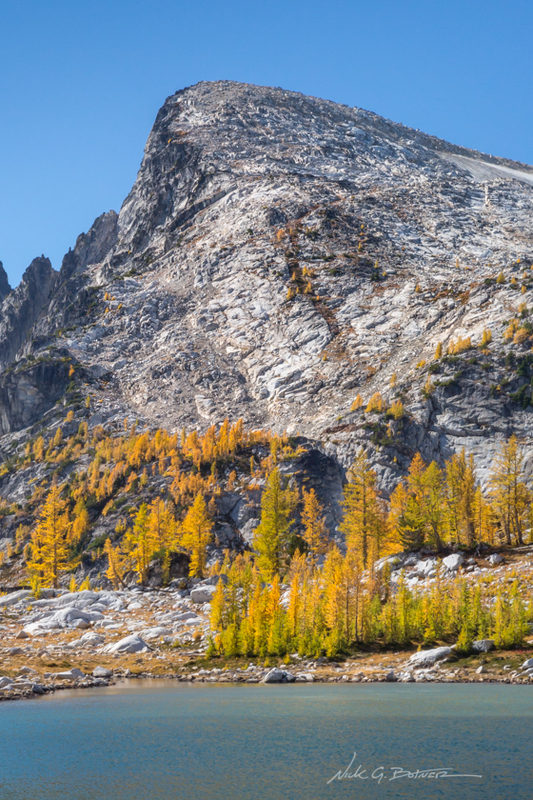 Which, turns out, aside from seeing the impressive Snow Creek Wall, there isn’t much else out of the ordinary until you at make your way to Nada Lake. 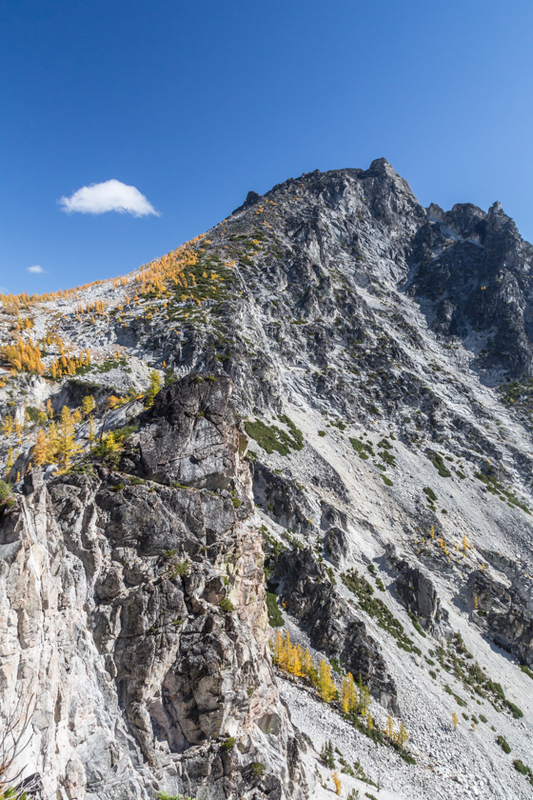 Snow Creek Wall is an impressive piece of rock with a long history of climbing. Some of which we saw on our way back out. 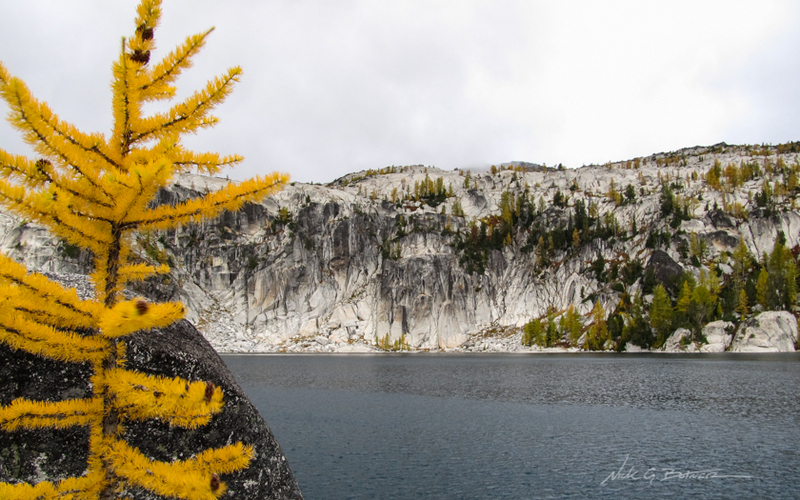 We made our way to Nada Lake in fashionable time. Sadly the weather wasn’t as good as I would have liked, so I opted out of taking a photo. I even checked Jen’s photos, and there was nothing worth showing. By this point we were six miles in and covered roughly 3,500ft in elevation gain. There was one more push to get up the 700ft it takes to make it to the Snow Lakes and then it would be an easy mile or so to finding our camp. 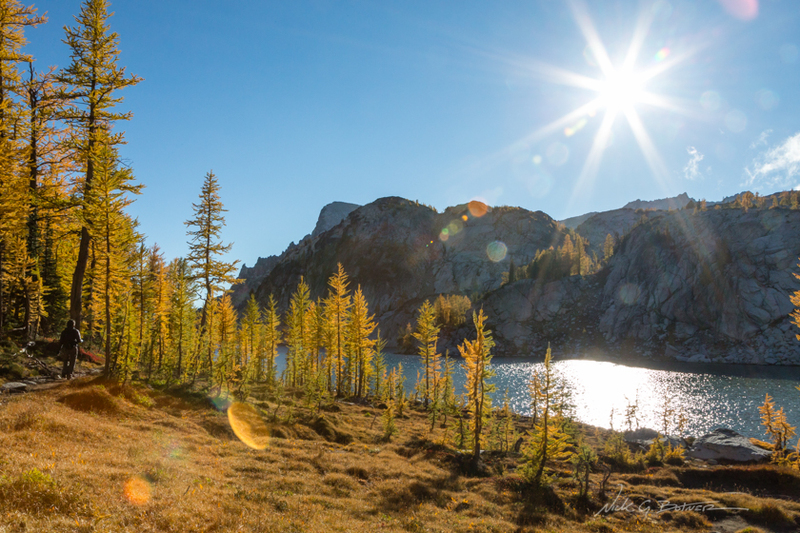 Once we made it to Upper Snow Lake, it was time to find a marked campsite with enough room for multiple tents and close proximity to the trail leading up to the core. 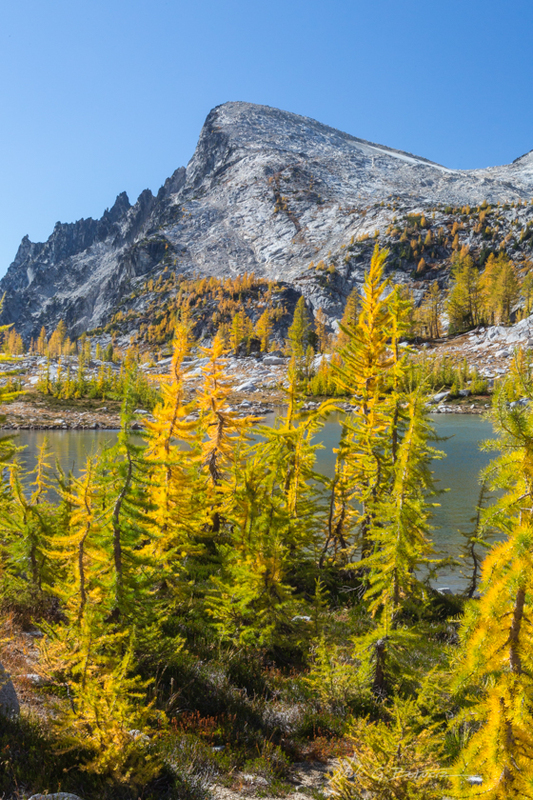 So we made our way around the lake and found a campsite along the lower east corner of the lake with a fantastic view of Temple Mountain. 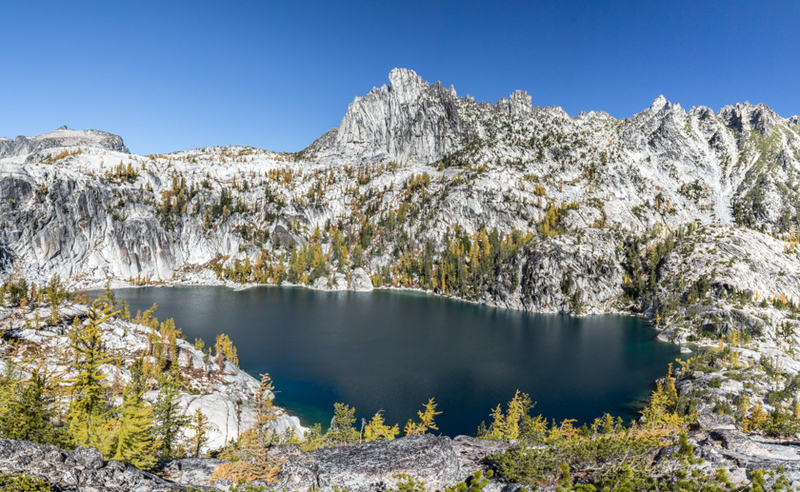 Our view of Temple Mountain and Upper Snow Lake. Another reason I was pushing for a site further down the path was I was hoping it would be easier to get water from the lake. The lake was currently 50ft below its normal water level. 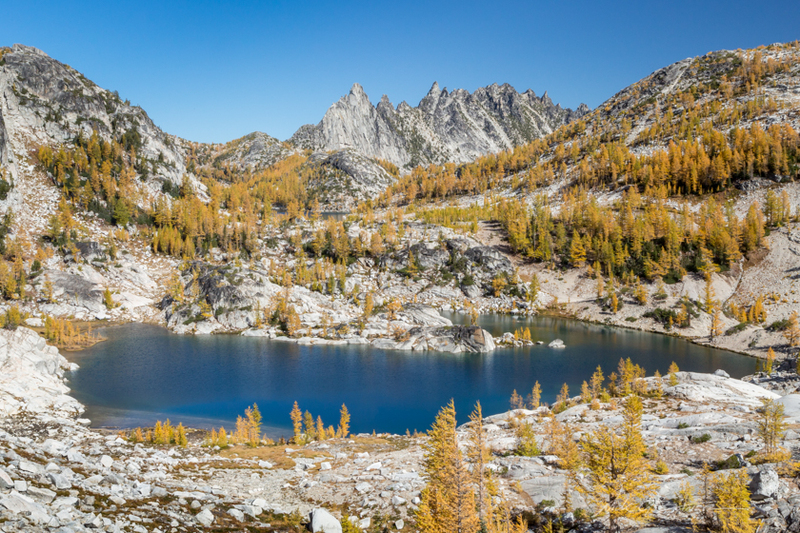 And We were told that if we needed water, we would have to get it from either Lower Snow Lake or the river mouth that empties into Upper Snow Lake. 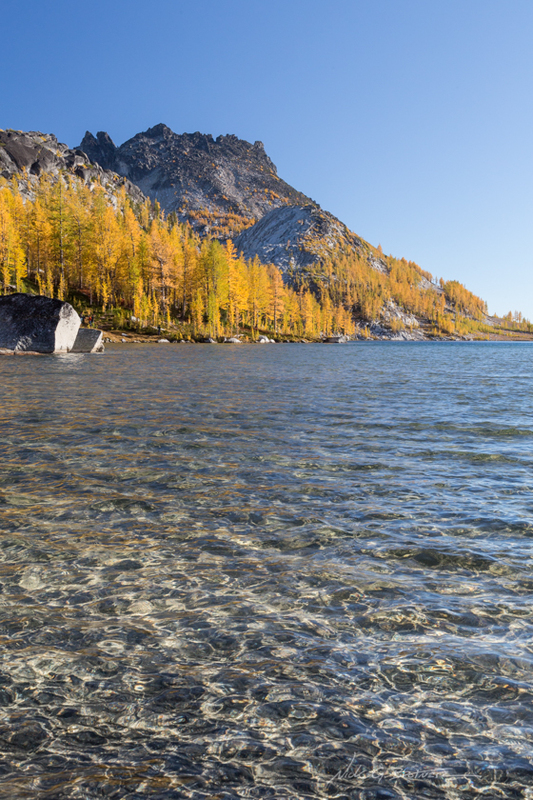 Being a person who likes a good challenge, I decided to get water directly from the shores of Upper Snow Lake. Getting down to the water wasn’t the hard part. The hard, or should I say extremely soft and mucky part was making it to the water’s edge…without sinking knee deep in silt. Adjusting my plan, I found a bank on the lake that was almost a straight drop, this would allow for solid footing and the time needed to scoop up the water. With eight liters of water in tow, I made my way back up the banks. This, to me, turned out to be the hardest hike of the trip. Just imagine having to trudge up 100ft of sand dunes with 9 pounds of sloshy water in each hand. Needless to say, I would not be repeating that again for the rest of the trip. With our water supply replenished, we finished setting up camp and got busy with cooking dinner before the night’s cold could settle in. The night wasn’t too cold. But we did awake to the light drizzling of rain on our tent. We knew this was coming, and were prepared for it. 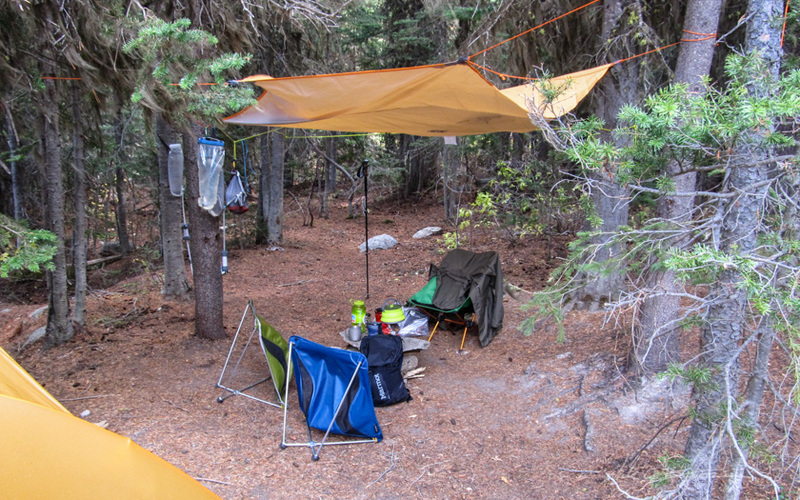 Thankfully Jen brought a lightweight camping tarp that we transformed into a shelter amongst the trees. By the time we had the mechanics of the water runoff figured out, the rain more or less stopped. Of course the rain would come and go in little spells, but the real joy of the tarp was that it gave us a shelter to call home. 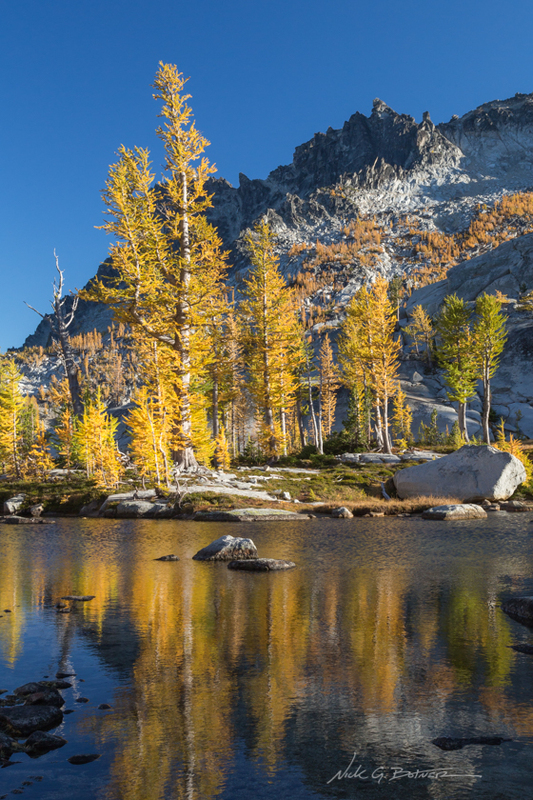 A place where we could all return to and make our coffee and cook meals without fear of pine needles sneaking their way into our unsuspecting mouths. The plan for the day was to wait out the rain a little and then make a quick trip up to the core to check things out. Today was also the day two more friends would be joining our party, so we wanted to try to be back before they arrived. We waited for the weather a bit longer than we wanted, so we decided to just hike up there regardless of the rain and clouds. But before heading out, we made a small paper sign for our friends and placed it along the trail. The goal here would be to inform them that this was their camp and that they should hike no further. Sadly, I cannot take credit for this moment of brilliance. I got the idea from another backpacker the day before. After roughly two miles and less than an hour of hiking we arrived to the entrance of the lower core. The route would have been a little shorter if we were camped closer to the trail. But the extra ten minutes of flat hiking was of no matter to us. 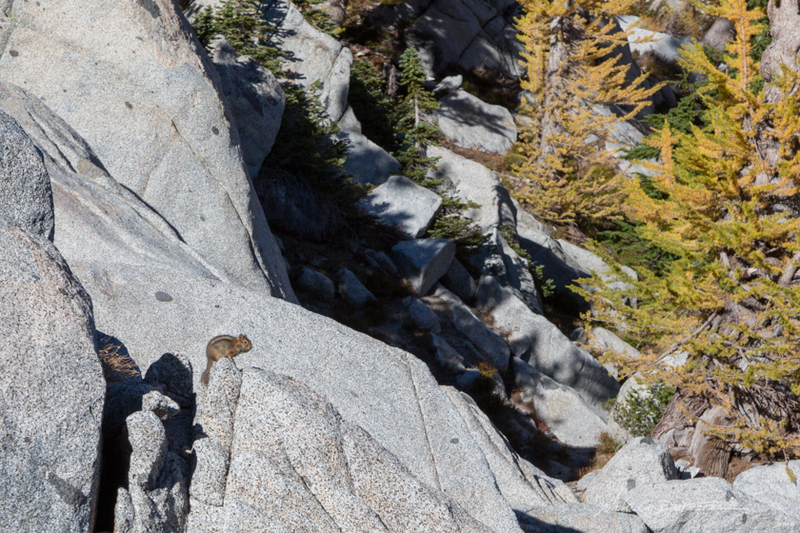 And while the trail up to the core is a little steep, there are some choice bouldering opportunities along the way. All of which make it a fun little hike up to the core. 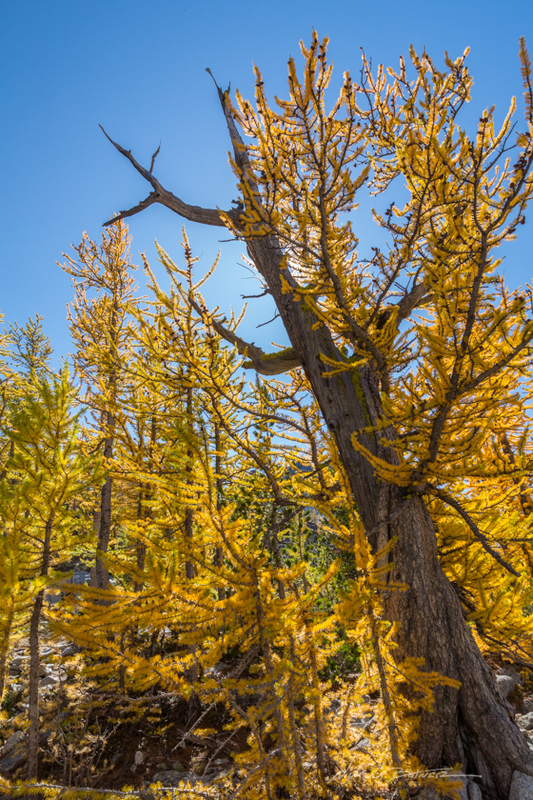 You know you’re getting close when you start seeing larches. One we made it up to the core, the weather was so cloudy that we could only see across Lake Vivian. And in addition to the clouds, the temperature was easily ten degrees colder with gusting wind and rain. Even with bad weather, it’s hard to not get excited. After spending roughly an hour or so hiking around, we now had a better idea of what to expect for the next day. 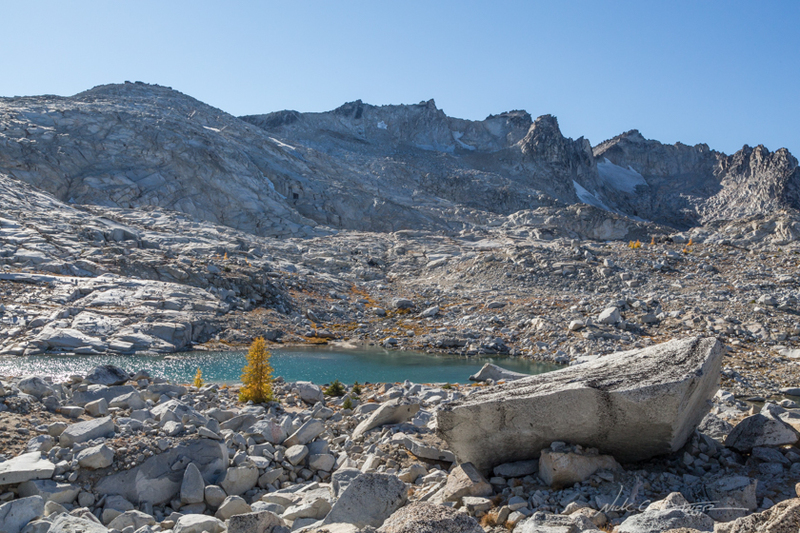 There were some tricky parts of the trail that we were able to work out and we kind of guessed where the trail was for Temple Lake. But no one wanted to go up there at this time. The day was getting a little late and we wanted to make our way back to camp before our friends arrived. 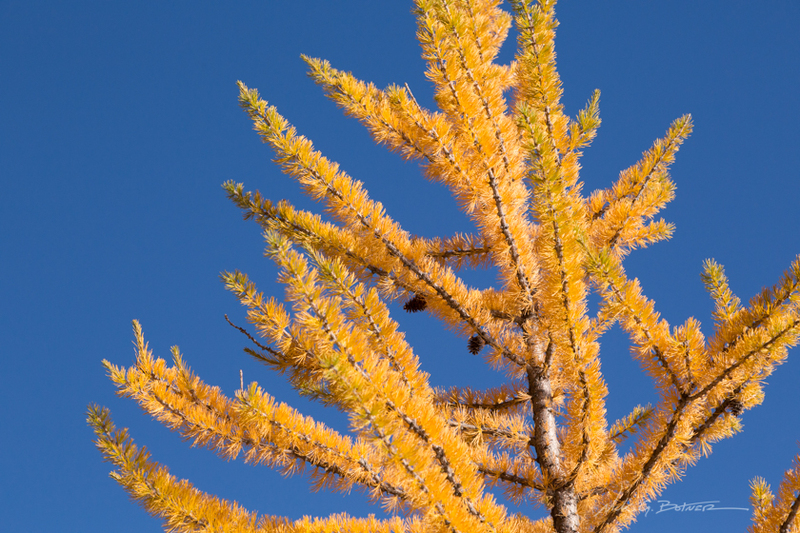 This is a larch. It’s surprisingly soft. I was expecting to get back to camp and have the addition to our party there waiting for us. But surprisingly, they were not there. So we went about our ways and I decided to build a small table for our camp. 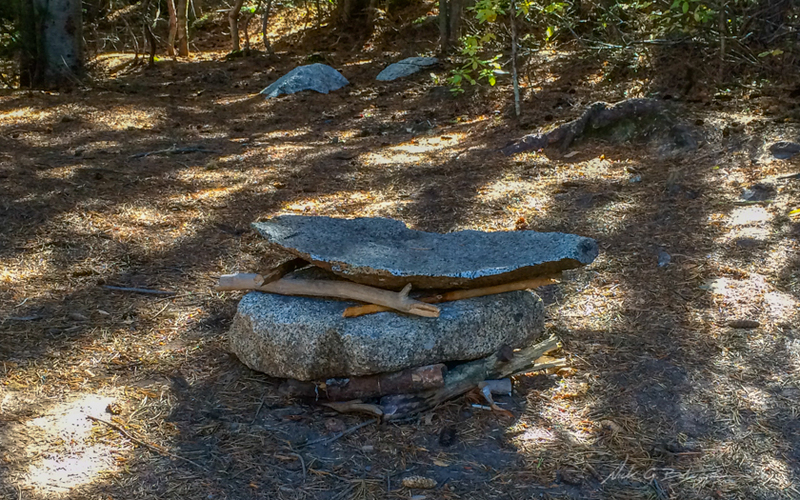 Find a flat rock and use sticks to level it out and keep it from moving under pressure. It was now getting late and way past nightfall. I was beginning to think our friends either bailed on the trip or just camped at an easier location like Lake Nada. But around 8pm I saw headlamps coming up the trail and it turned out to be our friends! Turns out, someone saw my sign earlier in the day, and when they saw my friends wandering about they asked who they were. This camper put two-n-two together and was able to instruct them towards our camp! 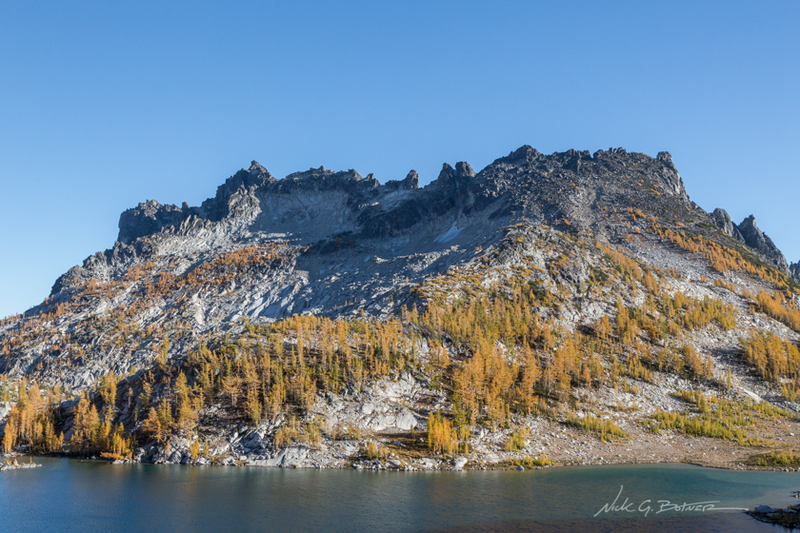 Today was the day for larches lakes and summits. We got up relatively early and hit the trail with everyone in tow. By now the path up to Lake Vivian was familiar with us and we experimented with a couple bouldering routes along the way. By the time we made it over the final hump and reached the core, there wasn’t a cloud in the sky. It was like a whole new world to us. Everything that we has seen the day before was transformed by the light. And in addition to the enchanting glow that everything took on, the view of the surrounding area was almost overwhelming. Lake Viviane in shiny new light. 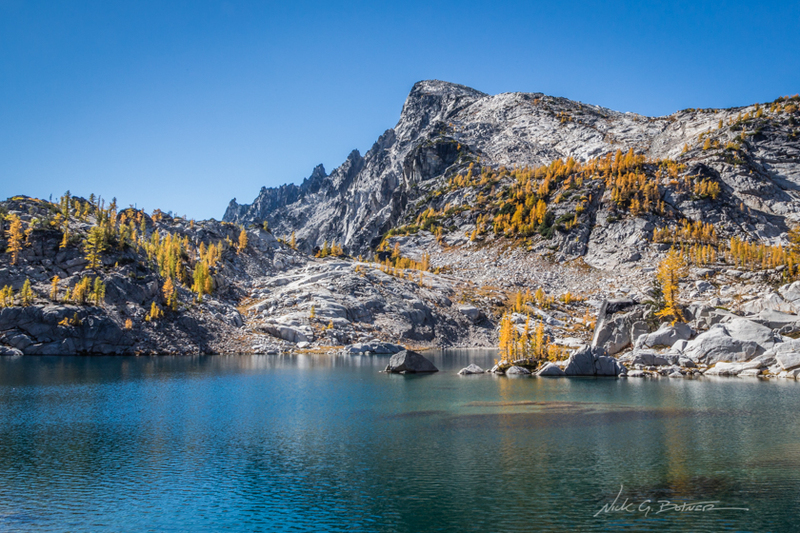 Lake Viviane with Prusik Peak, an impressive start to the Core Zone. 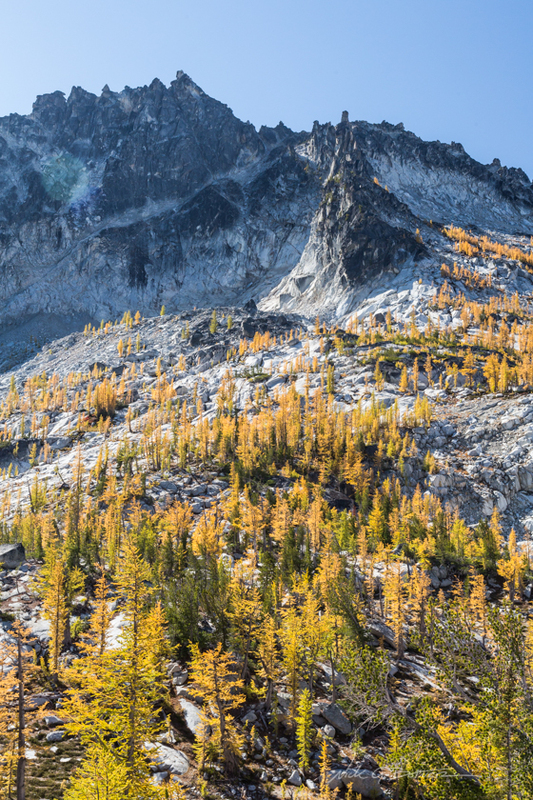 Larches scatter themselves across the rocky alpine landscape. 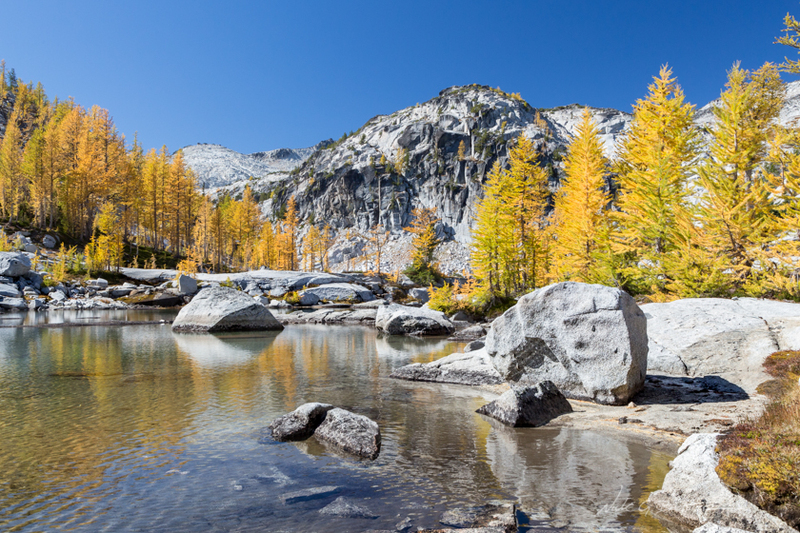 Once you reach Lake Vivian, the trail heads south, over the small log jam, and around the south side of the lake. 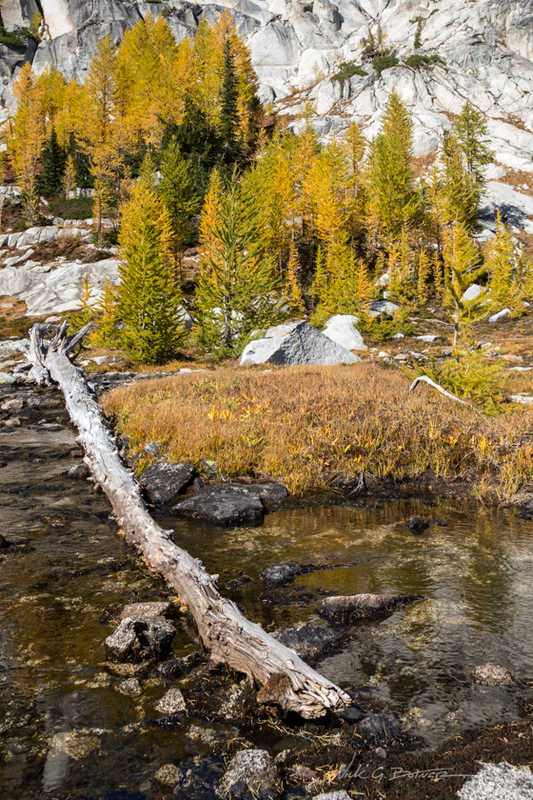 Looking down at Lake Viviane with Prusik Peak looming overhead. In order to continue into the core, you will need to make your way up the rocky hump. 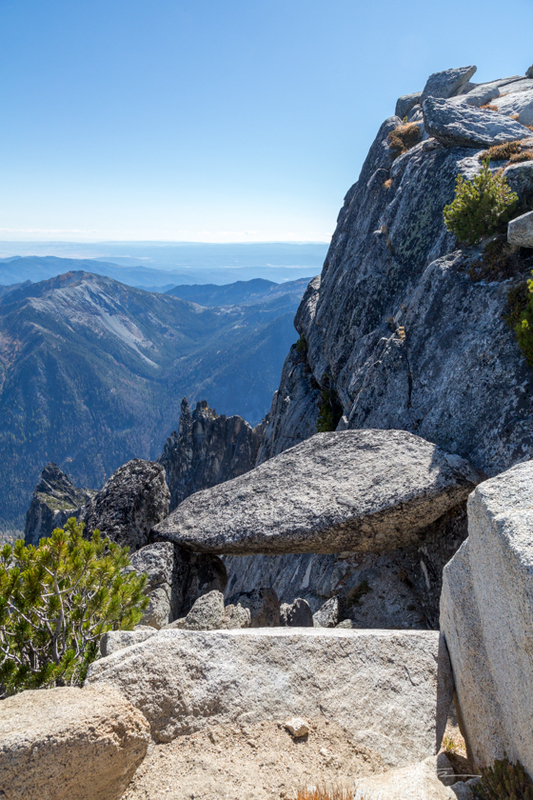 You will know you are on the trail if you find rebar embedded into the granite boulders. While this might seem unnecessary in the summer months. I can only imagine what a godsend these must be when things are icy and slick. 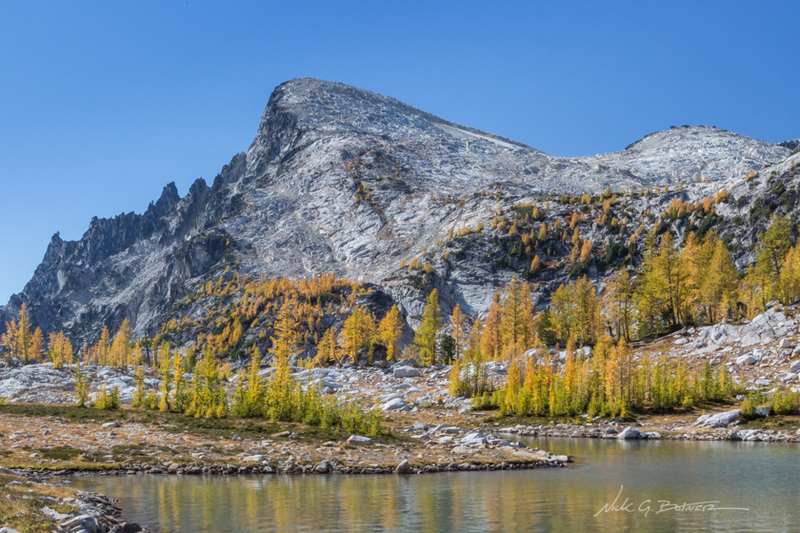 I might have a slight infatuation with Prusik Peak. 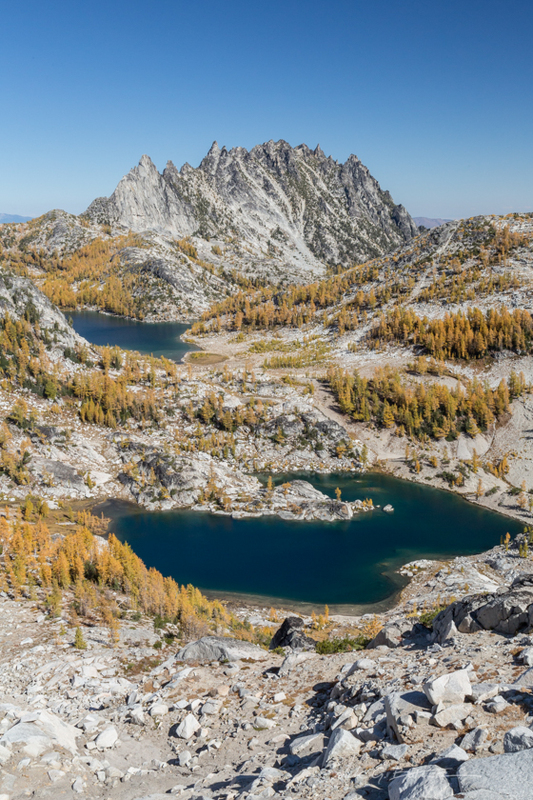 Facing west, overlooking the lower Enchantments. From this same rock hump, and looking to the west, we get a view of our destination, Little Annapurna. 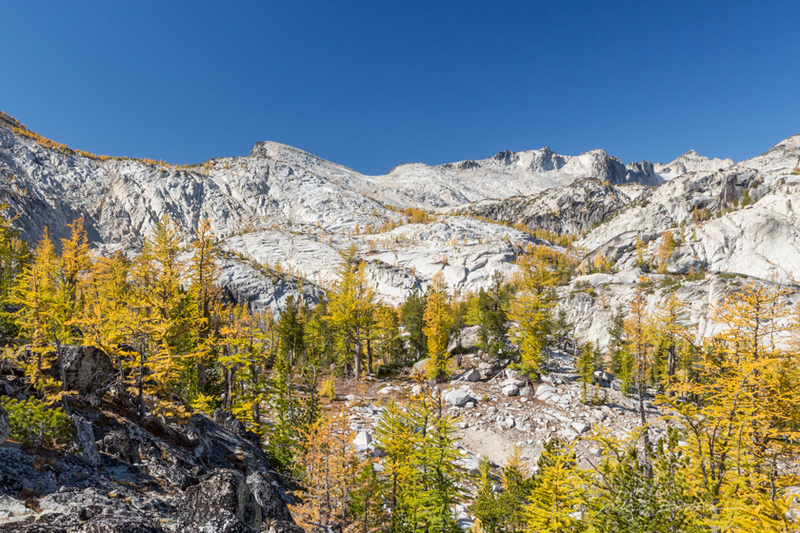 It’s the peak to the center left, the one with it’s left side a sheer cliff. Closeup of the summit on Little Annapurna. 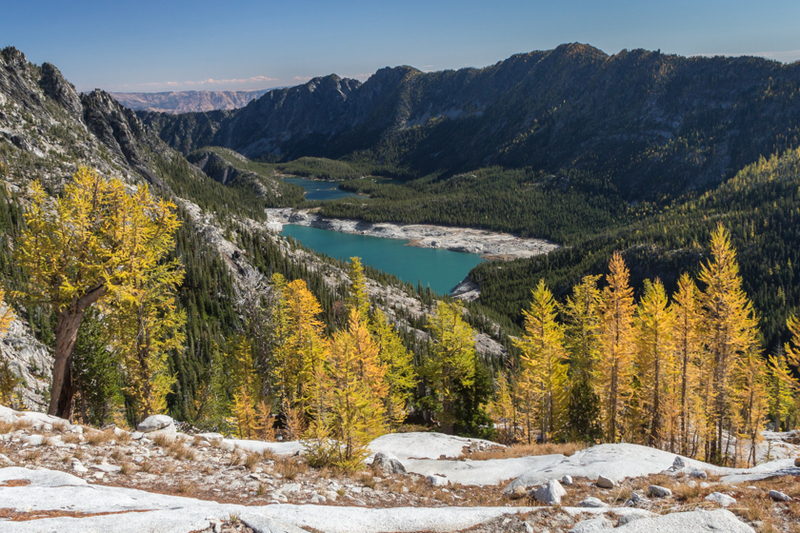 And if you turn around and face East, you get a view of the Snow Lakes. Our camp is just out of sight, on the south shore. From here you really get a better idea of how low the levels are at Upper Snow. Looking south, a view of McClellan’s jagged ridge. 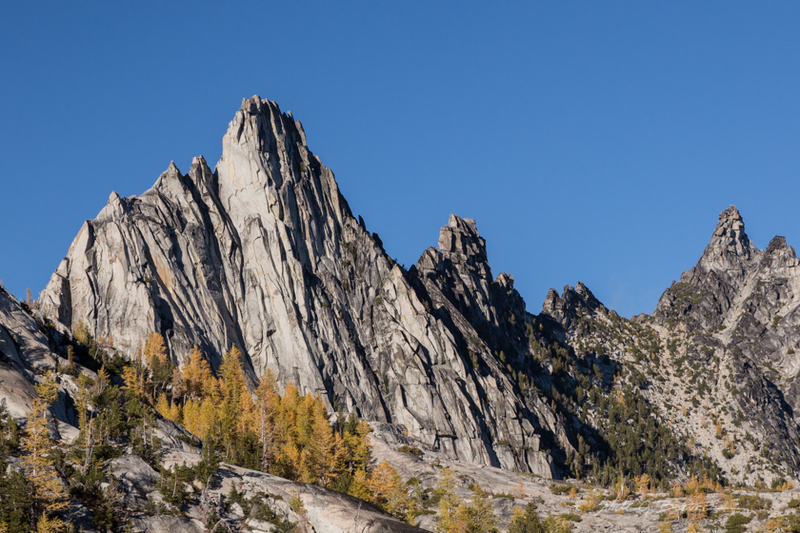 Another view of McClellan and it’s jagged spire. 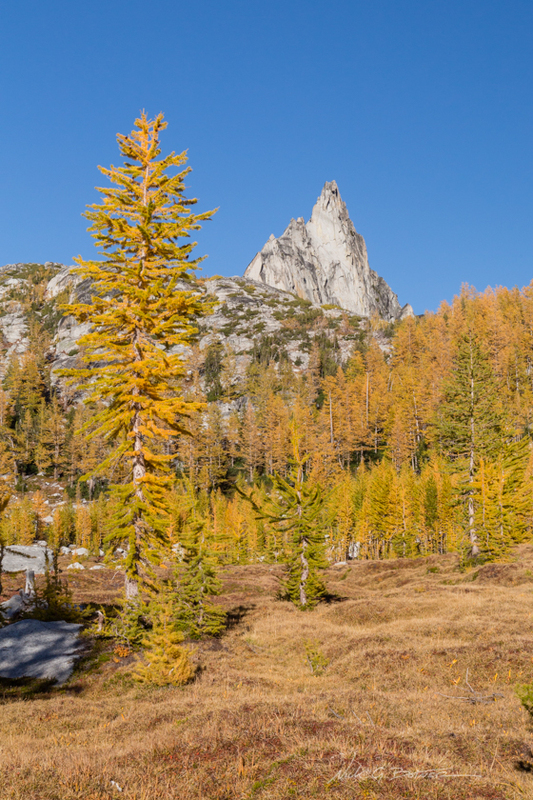 Prusik Peak, with 100% more larches! 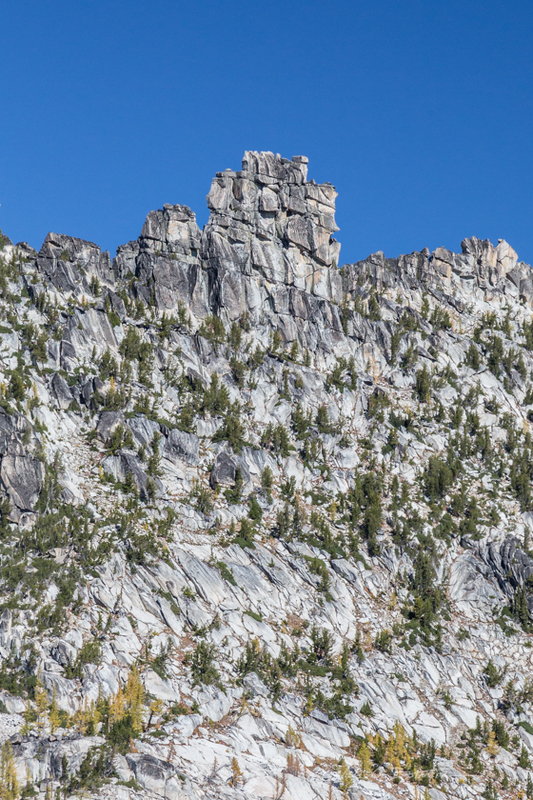 Prusik shares the same ridge as Temple Mountain. Or also called The Temple. I’m figuring it gets this name as most of the rock formations resemble square stones used to build ancient temples. Panoramic of the Lower Core. 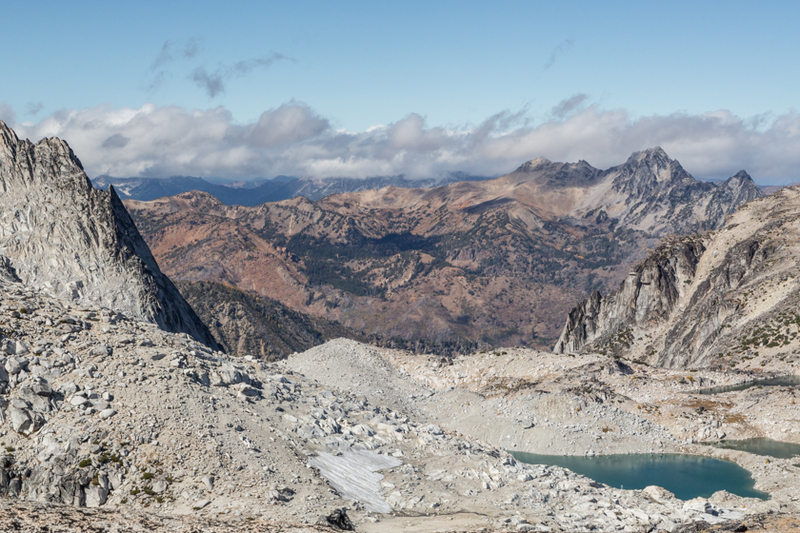 Overlooking the Lower Core, you have Little Annapurna on the left, with Leprechaun Lake below it. 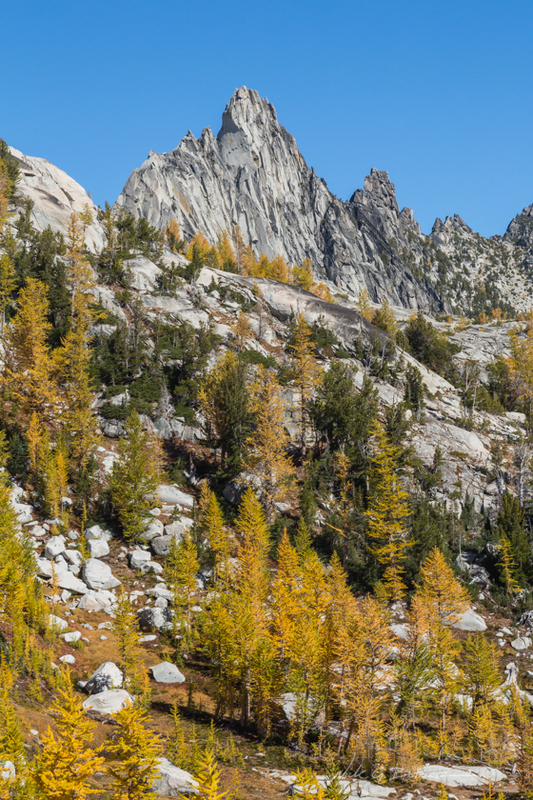 Then in the center you have the Enchantment Peaks. And by now you should be able to make out Prusik Peak with Lake Vivian below. By this point we decided to split as a group. Our friends who joined us last night opted out of the summit run and instead decided to explore the lower core zone. While Jen, Florida friend and myself continued our push to the summit. 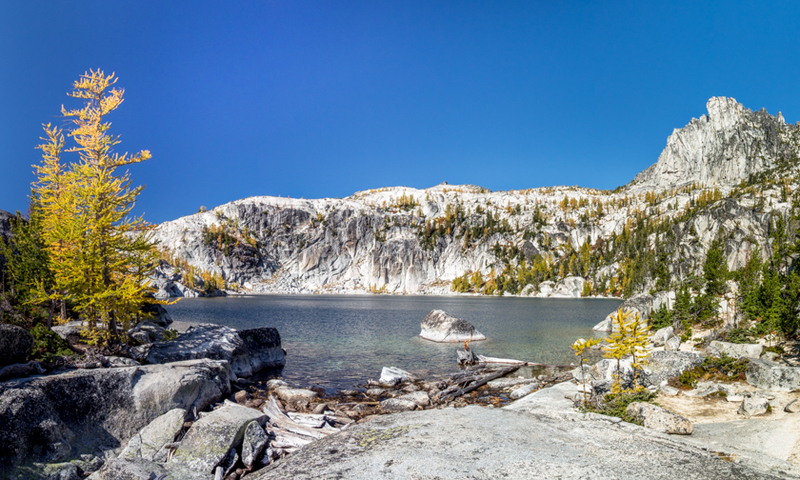 Leprechaun Lake with McClellan in the background. Of course it was hard to not stop every other moment and take another amazing photo. 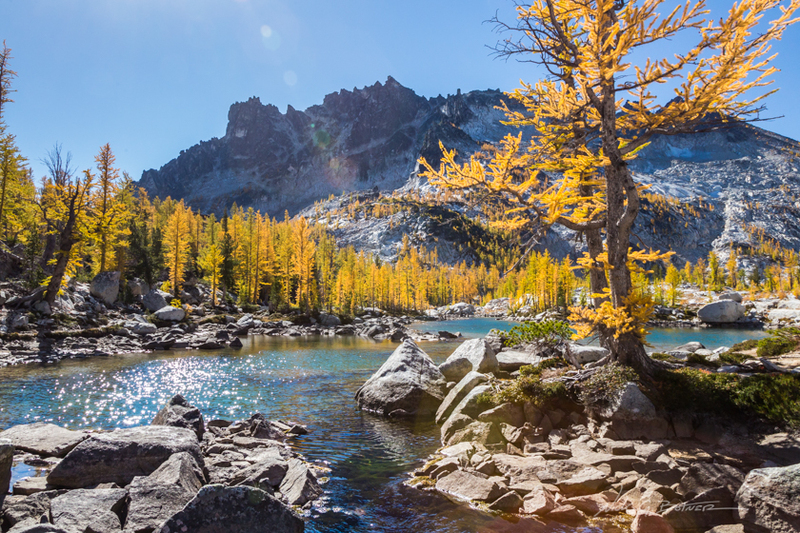 This is Leprechaun Lake. It’s an oddly shaped lake. Kind of like a V or more like a check mark. 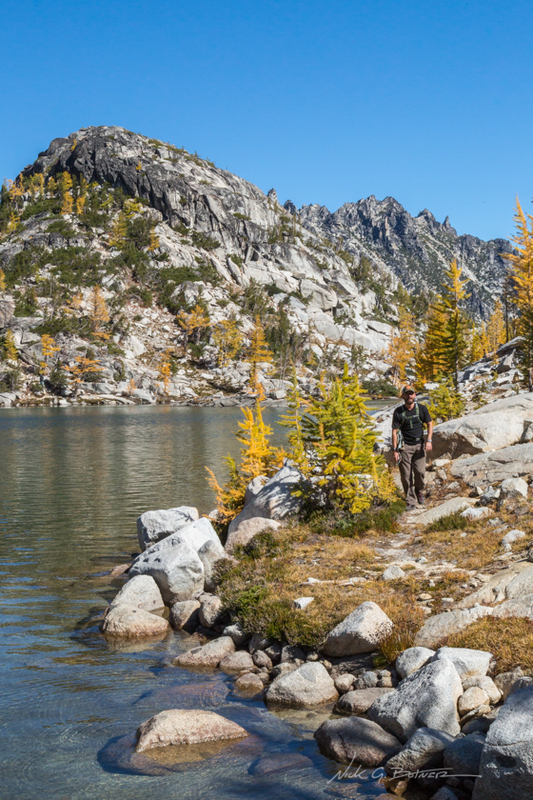 Either way, it’s important to remember to go to the right to stay on the trail. Another view of McClellan from the edge of Leprechaun Lake. Once you pass Leprechaun, the trail continues east. 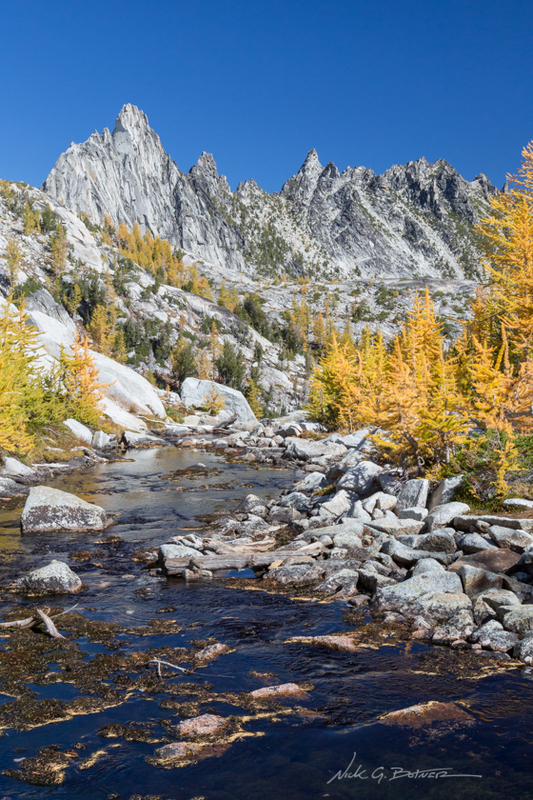 It follows Snow Creek which will eventually take you to Sprite Lake. Part of the meandering creek as we pass through the Lower Core Zone. Another look back at Prusik, just to make sure it’s still there. 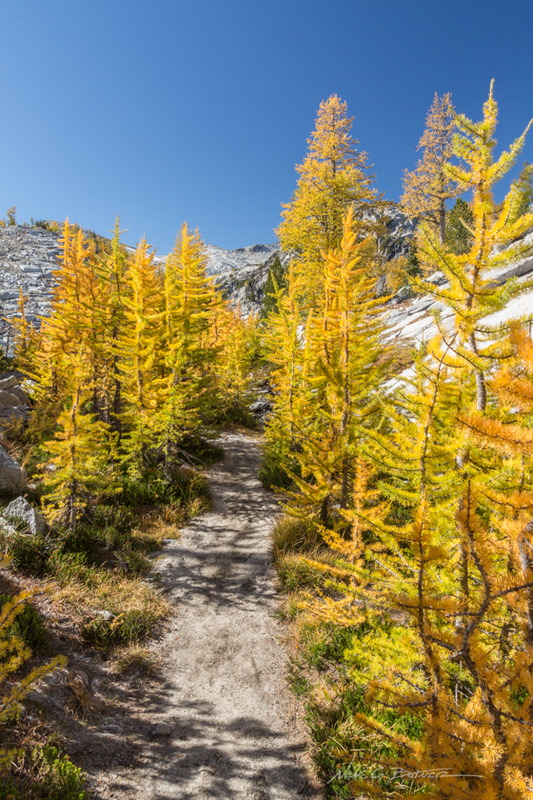 The part of trail between Leprechaun and Sprite is loaded with soft glowing larches. It’s hard to describe what it feels like to make your way through this part. It was definitely overwhelming all of the senses. 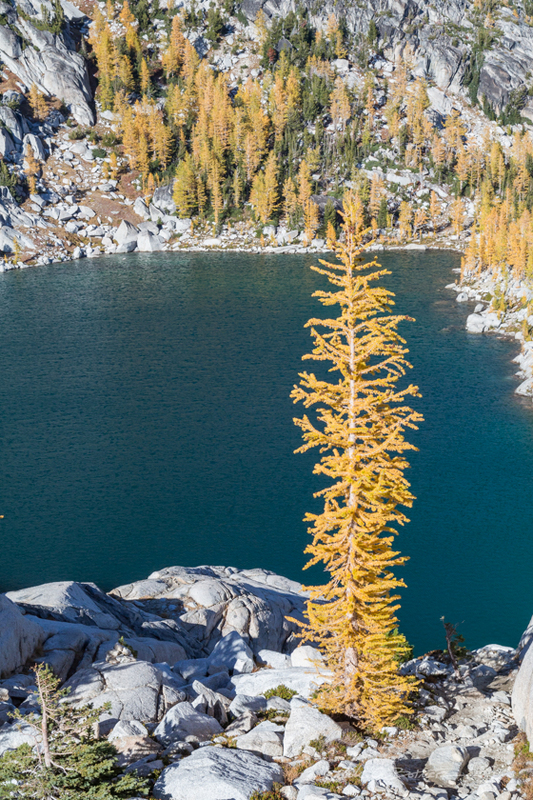 After making our way through the larch tunnels we arrived at Sprite Lake. Which just so happens to be behind me in this shot. I wanted to grab one more view of Prusik and Temple before they slipped from view. Sprite Lake with a glimpse of Little Annapurna in the far background. A better shot of Little Annapurna. Perfection lake with Little Annapurna looming over it. From this point we made a decision to not take the easy route up. 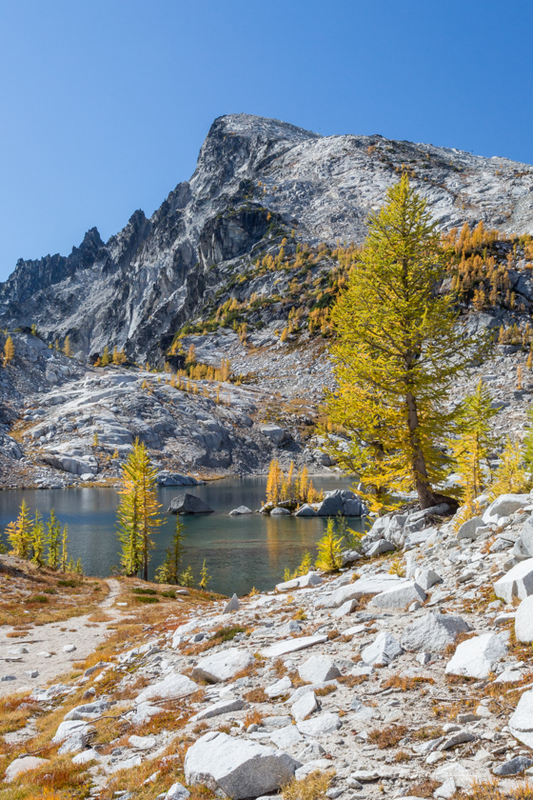 If we had wanted the basic walk up, we would have stayed on the trail and turned right at Perfection Lake. Instead we chose to turn left and cross over the creek. This route would take us to the base of Little Annapurna. 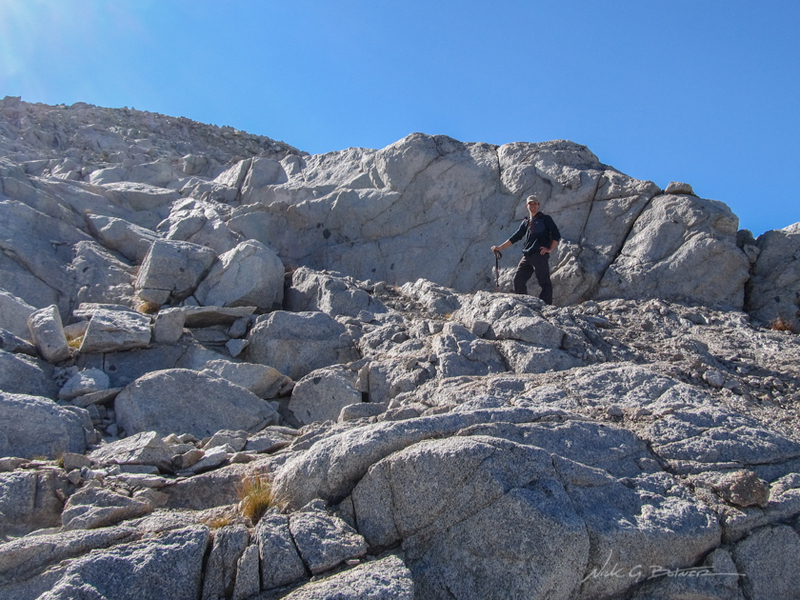 But from there, we would have to pick our scramble routes and make our own way up. While I can pick out our route from the above photo, there might be another photo that would better illustrate it. I’ll be sure to outline that and include it at the end of the post. Crossing along Perfection Lake, our Floridian friend was not so sure about the whole scramble climb. Almost past the edge of Perfection Lake. Another no name pond that’s almost dried up from the lack of water. If you look at the ridge in the background, that is where you typically walk along when you take the main route up to Little Annapurna. 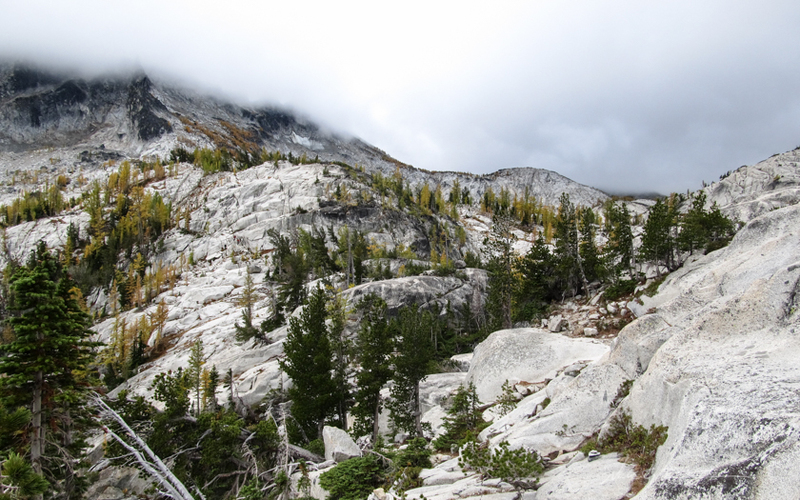 We will end up passing back along this ridge on our descent back to camp. Past Perfection Lake, Crystal Lake comes into view. 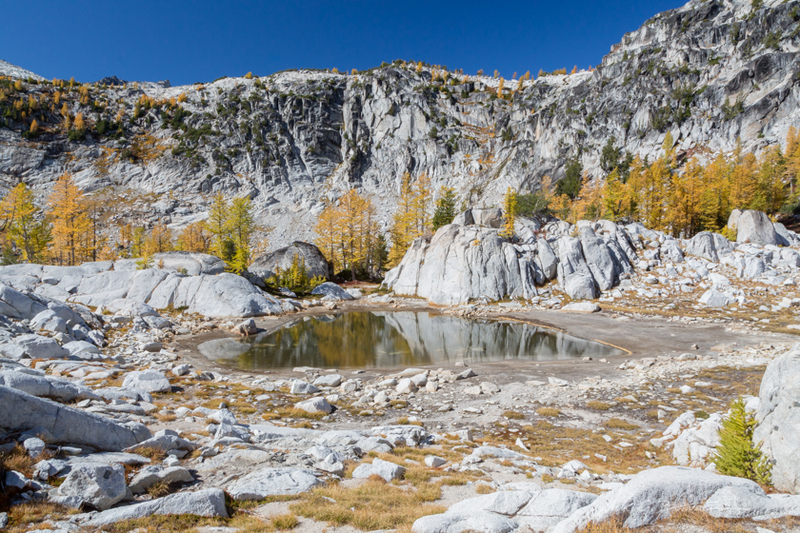 Crystal Lake, and not a soul in sight. 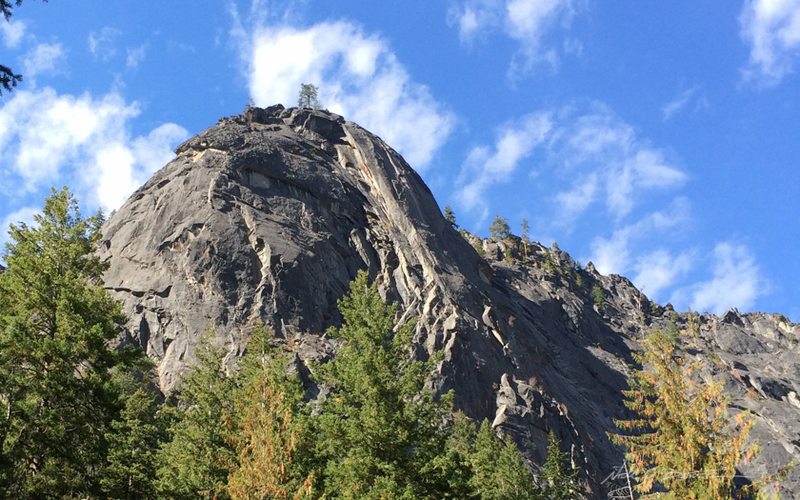 It’s a lot of fun to turn to your non hiking friend and tell them we are going up that. 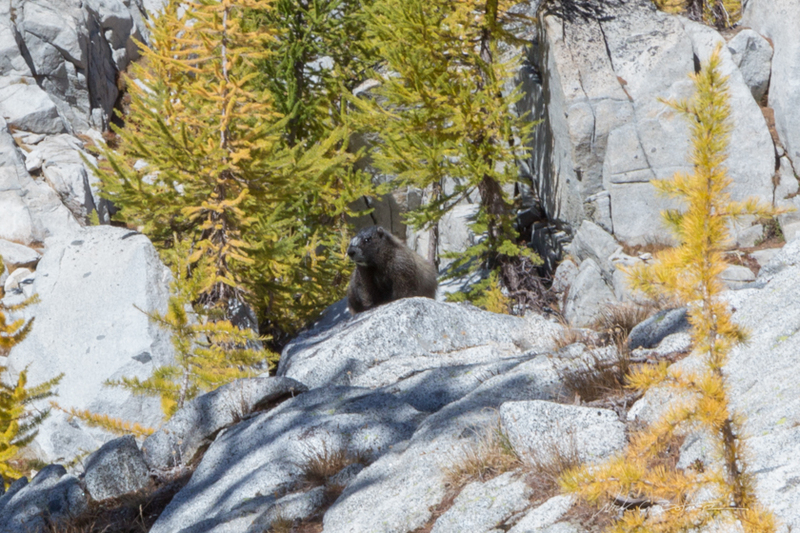 Hiding in the granite along Crystal Lake I spotted my first marmot. A bit more zoom and he comes into focus. 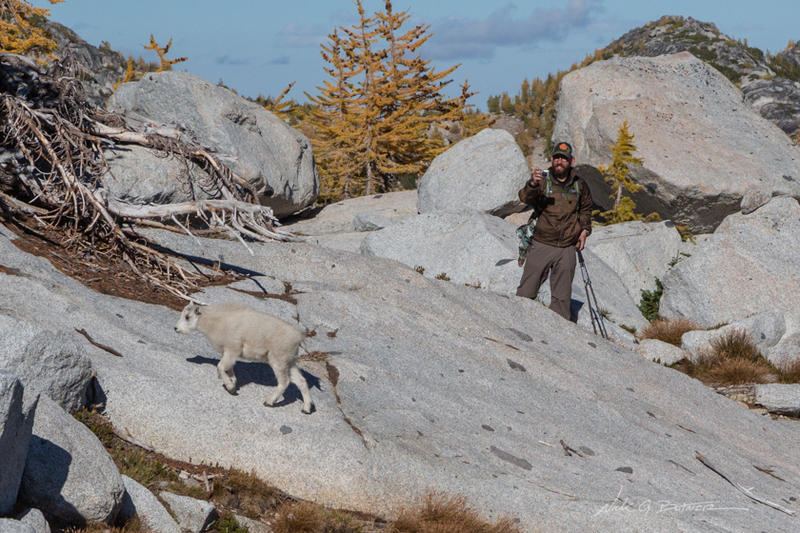 He didn’t hang around long before scampering back into the rocks and out of view. 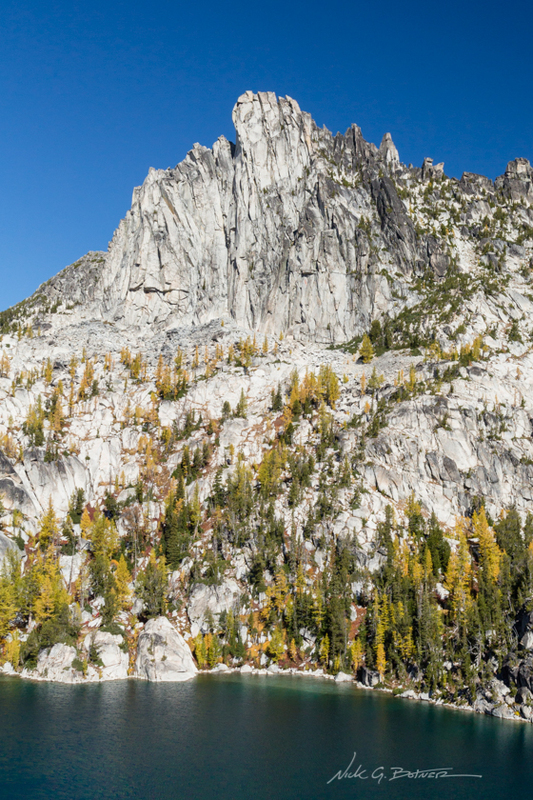 From this point on, it was time to put the camera away and start picking out scrambling routes. While I don’t always need to stow it, I figured it would be better to have it in a secure location and regain the full use of both hands to make the scramble up. A quarter of the way up, McClellan comes into view. From here, you can basically see the route it takes to summit McClellan. Next time. 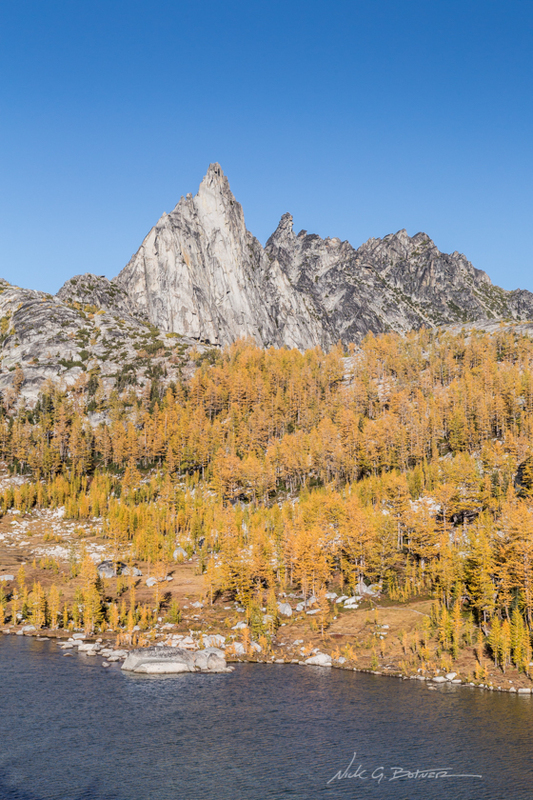 Looking back, you get a great view of Crystal Lake with Temple Mountain in the background. That’s me. Out sniffing routes for the party. Look at how happy I am. I should frame this and look at it every time I get sad about working behind a computer. 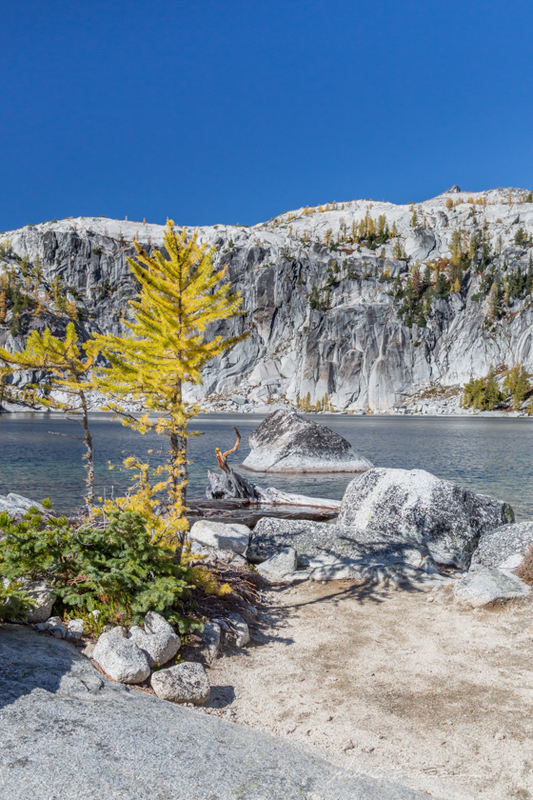 Crystal Lake with Perfection Lake in the background. 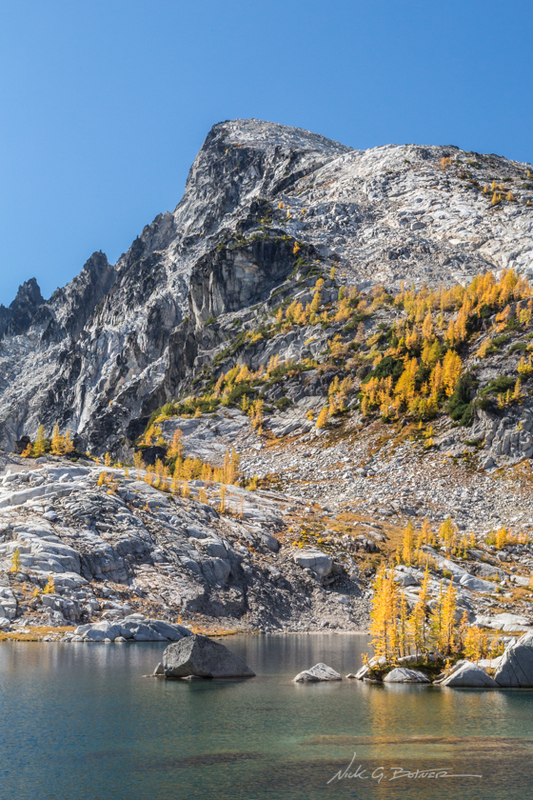 Wider view of Crystal Lake with Perfection Lake in the background. I’ll try to point it out. 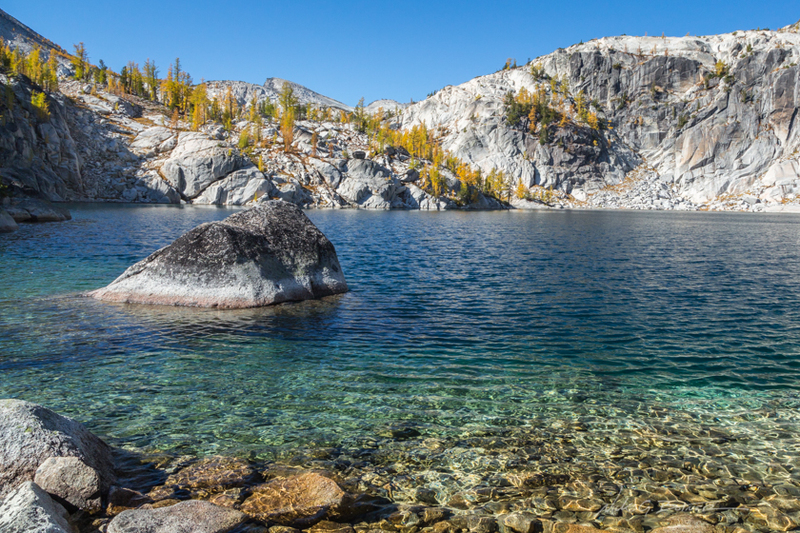 But if you look at Perfection Lake (the upper one) and you see the right shoreline, where it points out, and there is a tiny island. That is where you can go either right or left. Staying right and following the shore will keep you on the main trail. 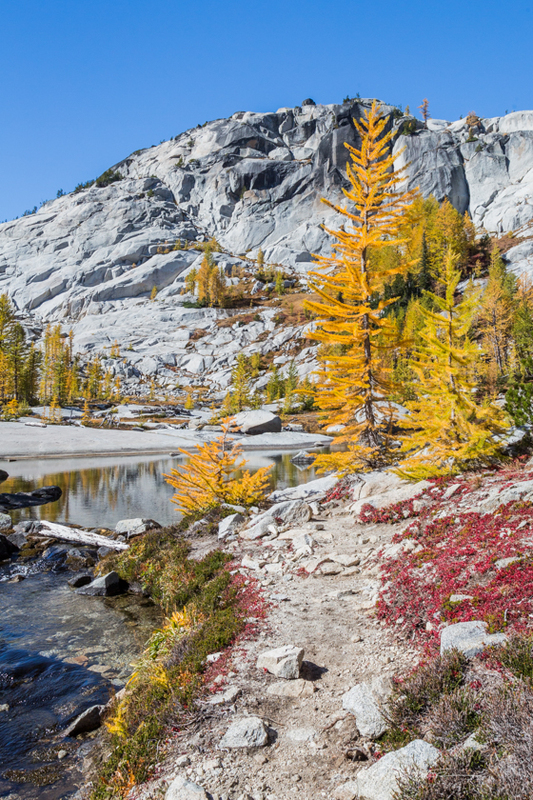 Turning left and crossing the creek brings you to Crystal Lake and this scramble. Actually, at this point we are now on the main path up to the summit. I didn’t take a photo of it, but there is one last steep hump to make it over before you hit the summit. 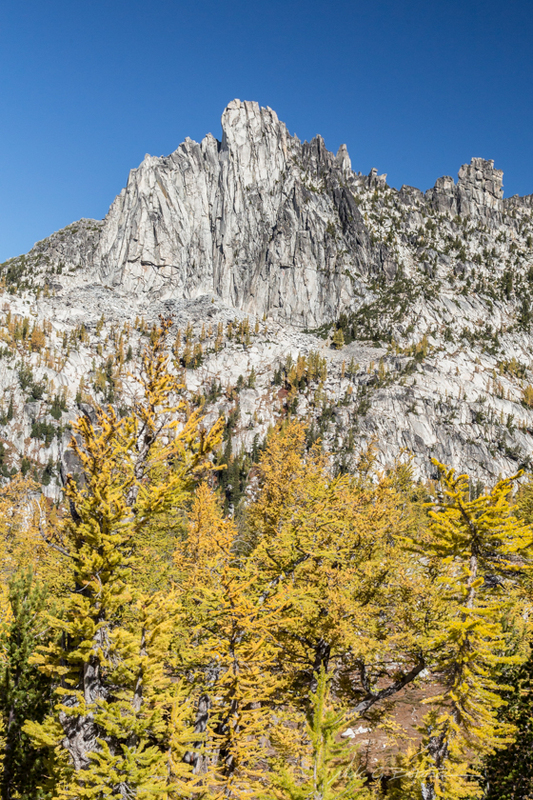 And while there is a marked and worn trail, you can basically take any route you like. The only issue is that towards the end, there is a lot of loose sand and gravel. Which takes a bit more concentration when you are working your way up such a steep grade. In fact, our friend mentioned this part, the sandy one, as the most challenging to him. Looking back at the lower core zone with Temple in the distance and McClellan to the right. A beautiful view of Mt Rainier with some interesting cloud action happening. That’s the official summit to the right. 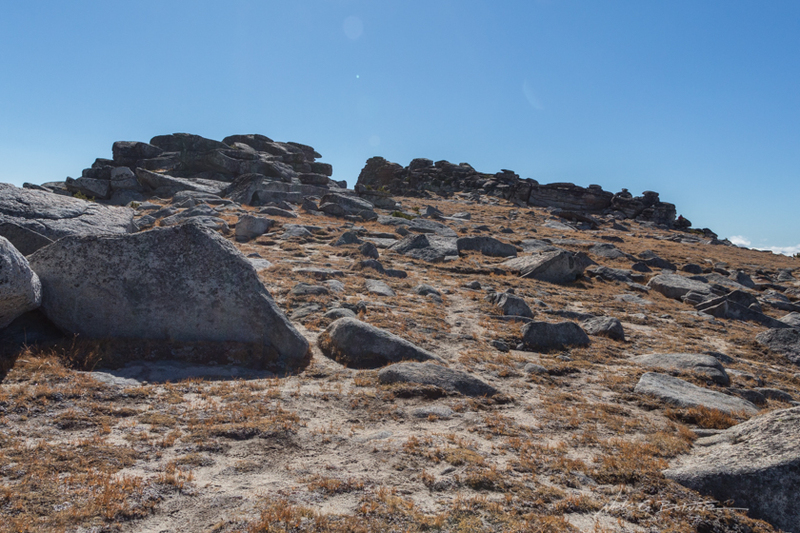 There are a couple of rock piles, I just wanted to get on top of all of them to make sure I wasn’t missing out on anything. Now I am on the official summit. 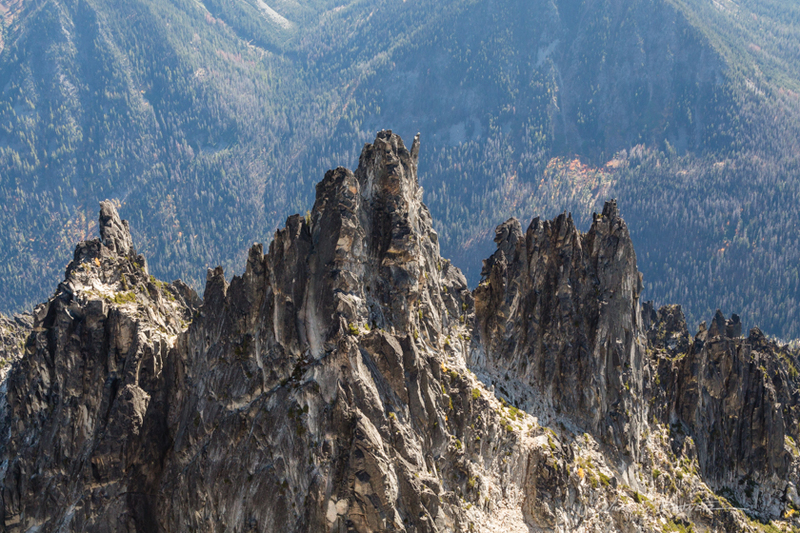 And when you look down the steep face you get a good view of the “Nightmare Needles” or I think it’s also called flagpole rock? I personally prefer “Nightmare Needles”. Here’s a view of last year’s enchantment trip. 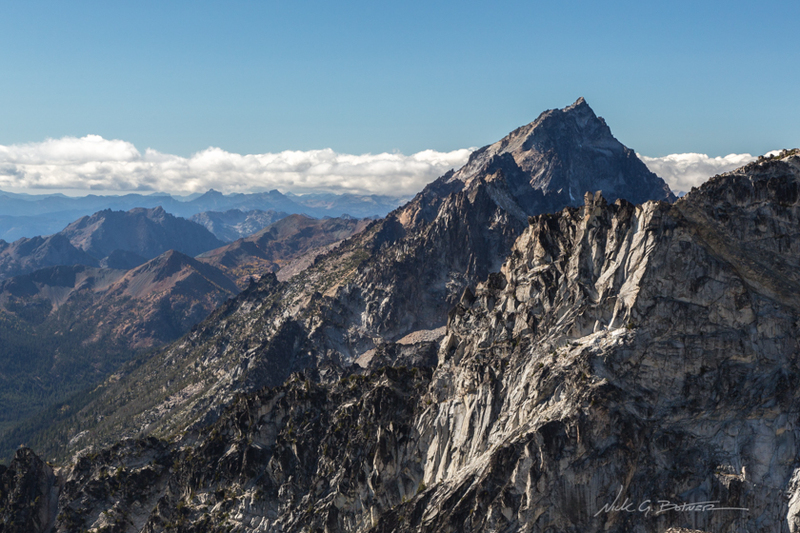 Well, this is really the top of Asgard (Colchuck) Pass. 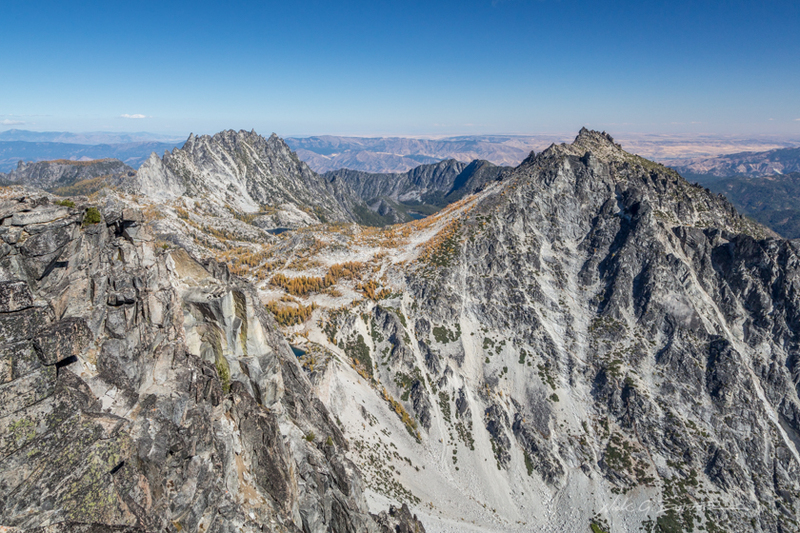 Below that is the Colchuck Zone, with the edge of Dragontail to the left. Also seen from Little Annapurna is a beautiful view of Mt. Stuart. Another view of the Lower Core Zone. You can now see Inspiration Lake to the far left. And that’s the direction of the main trail. It’s also the way we will take to make our way back to camp. 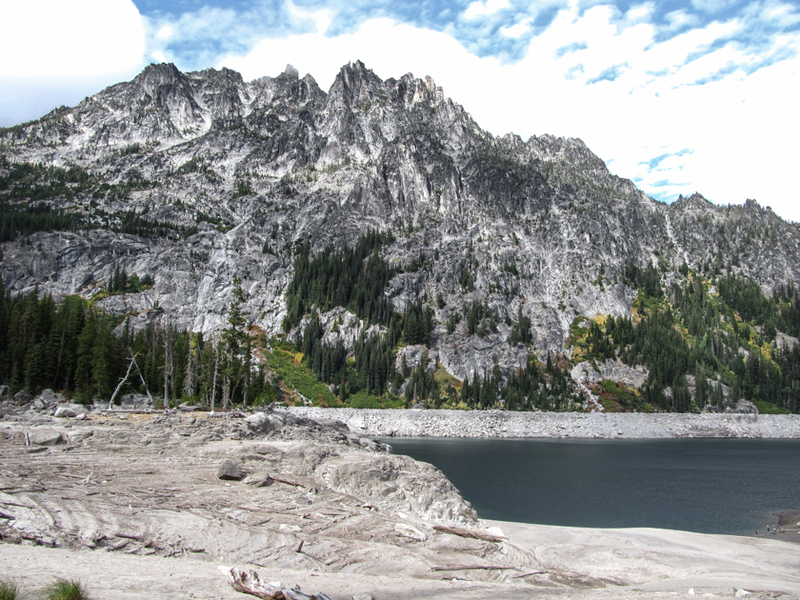 Which, you can also see the edge of Upper Snow Lake to the far right. And if you would like a better sense of scale, you can pick out a few tiny people near the center lower edge of the photo. After logging the summit, we took a break and ate some snacks. I decided to take the time to include some stretching. You will notice that I am wearing a rain shell. The wind was a bit gusty, and after cooling down from the hike, things started to get really cold. Thankfully my shell was the perfect breaker for it. Also, that is Dragontail in the background. With it a bit later in the day, and with our Florida friend pulling a muscle, we decided to make the trek back to camp and postpone a Dragontail summit for another trip. Also, this is a shot looking back up Little Annapurna, it’s what most people see when they decide to summit via the main walkup path. 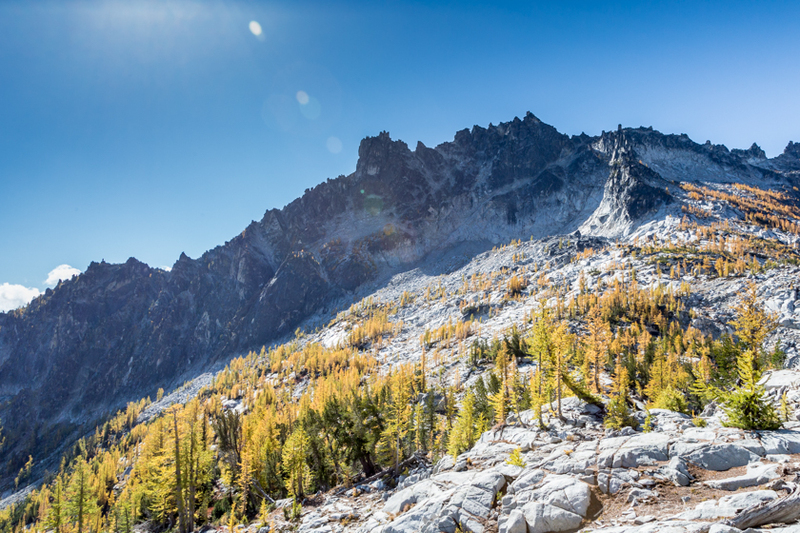 You can also make out a bit of the Snow Creek glacier shining in the sunlight. Officially off of Little Annapurna and into the upper core zone, we say goodbye to Dragontail and make mental notes about how we plan to approach it, for the next time. As soon as we were off of Little Annapurna and in the Upper Core Zone, we ran into a lot of these little guys. 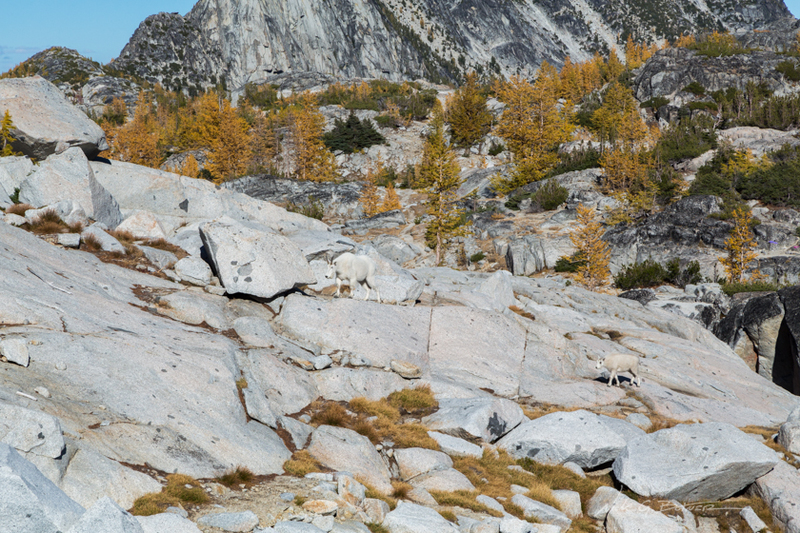 The goats do a really good job blending in with all the granite. But surprisingly, they are a non-native species. They were introduced by someone who thought it would be nice to have them make the place seem more alpiney. And while they are exciting to look at, they do cause a bit of damage to the fragile vegetation. And lacking any natural predators, they are controlled from time to time to keep their population in check. We saw a ton of baby goats. And it’s important to keep in mind that when you are trying to get a photo of a baby goat that you make sure to not entrap them in any way. Especially with their mommas around to defend them. That’s a very quick way to get gored by a mountain goat. And nobody wants that. 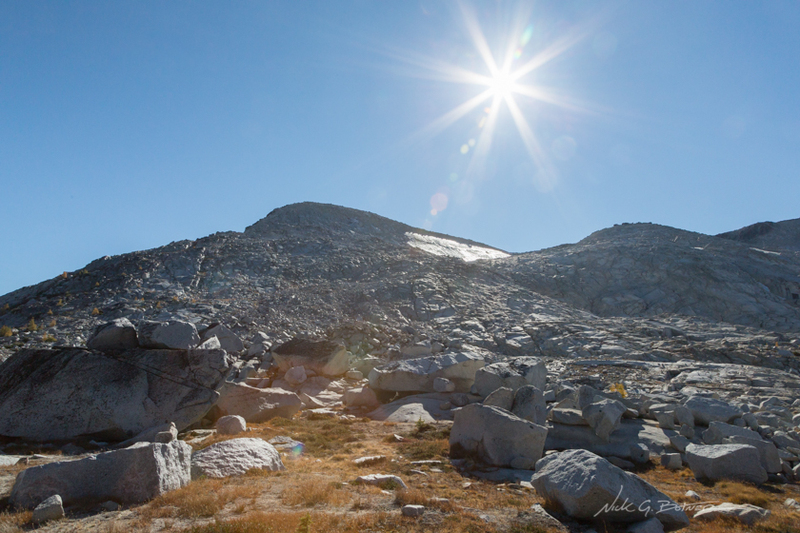 I mentioned it before, but we are now on the ridge that I was photographing as we were preparing for the scramble. 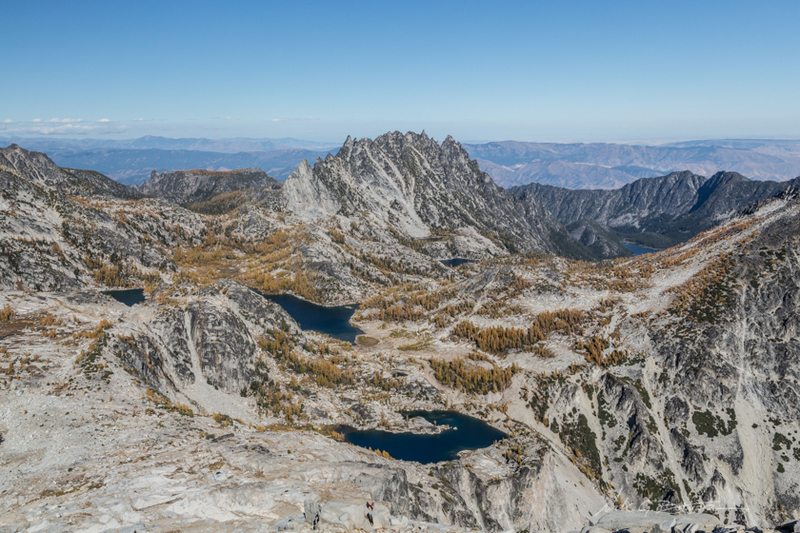 This is a photo of McClellan peak with Crystal lake below. We passed around the far side of the lake on our journey up. Jen takes a photo of me taking a photo. Photo inception? Teenager goats spar amongst the larches. 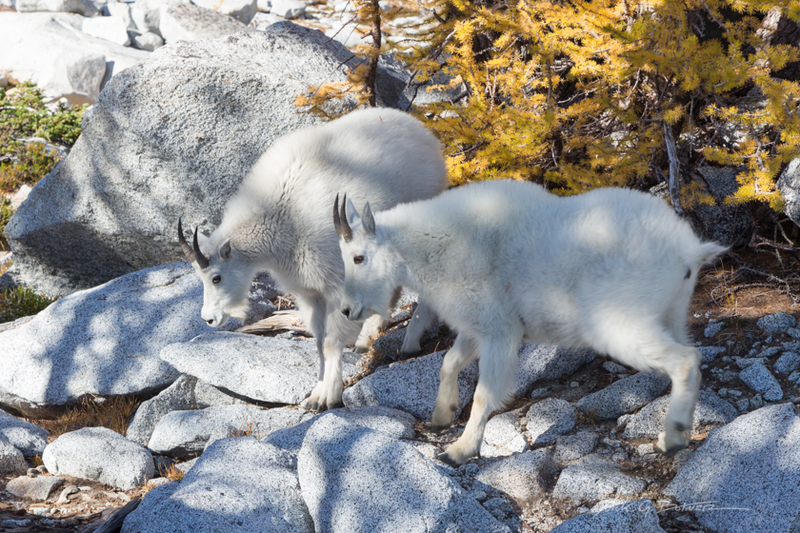 Even as youngins, both female and male mountain goats develop their horns rather quickly. 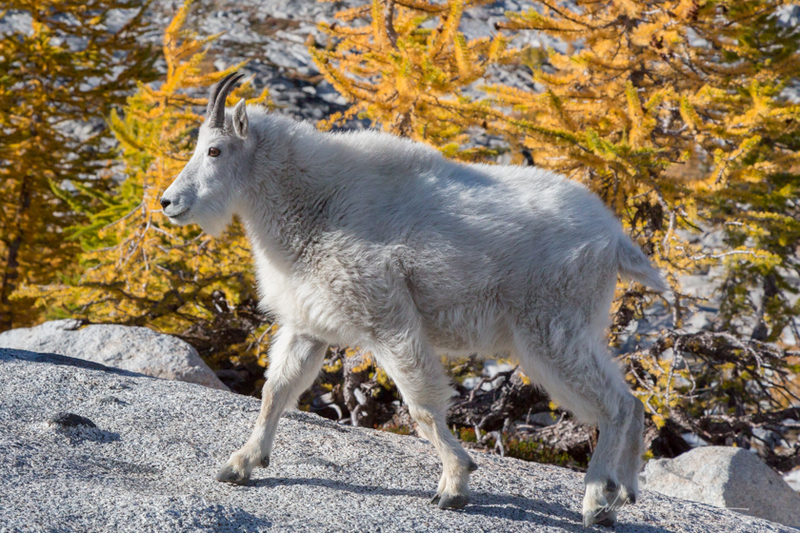 You can easily tell the age of a mountain goat by the number of rings on their horns. You just have to ask it to politely stand still so you can count them. Which brings up another interesting fact. 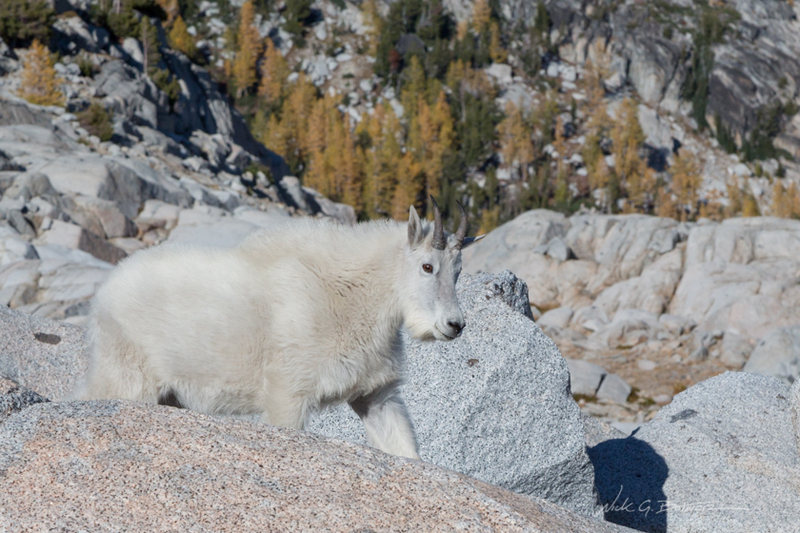 Mountain goats are not true goats. They are more closely related to the antelope. Better beards than I’ll ever be able to grow. And in addition to both sexs sharing horns, they also share the propensity to grow a wicked beard. And a final fact, and then I am done with the mountain goat facts, is that they all desperately want your urine. You can see it in the way this goat is looking at me. It’s sizing me up and waiting for me to have to go pee. 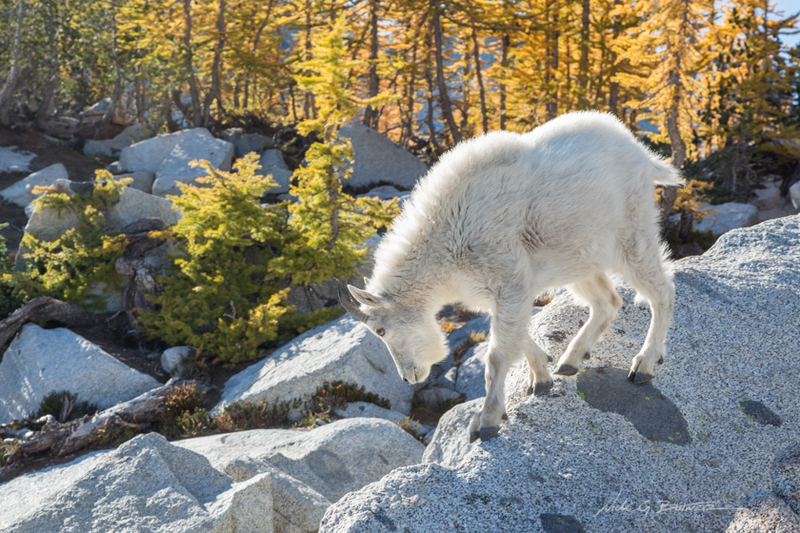 You see, mountain goats don’t get all the minerals they need in this harsh alpine environment. So, like you, with your daily glass of ensure, the mountain goat too needs to supplement its diet. But they do it instead with human urine. 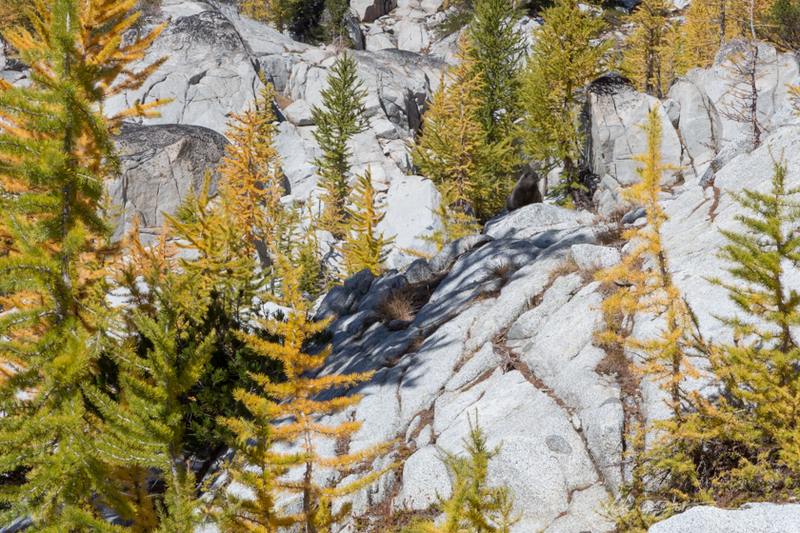 With that being said, you are advised to pee directly onto rocks or the middle of the trail. This way, the goats will not destroy (eat) the vegetation trying to get their delicious minerals. 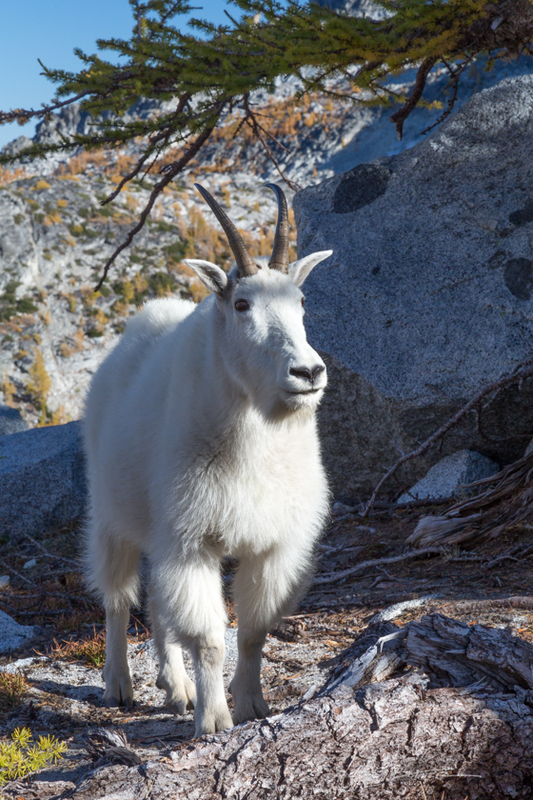 You also might wake up to a few goats outside your tent, waiting for you to go pee. It’s best to scare them off before attempting to pee. There have been accounts of goats knocking people over in mid pee. 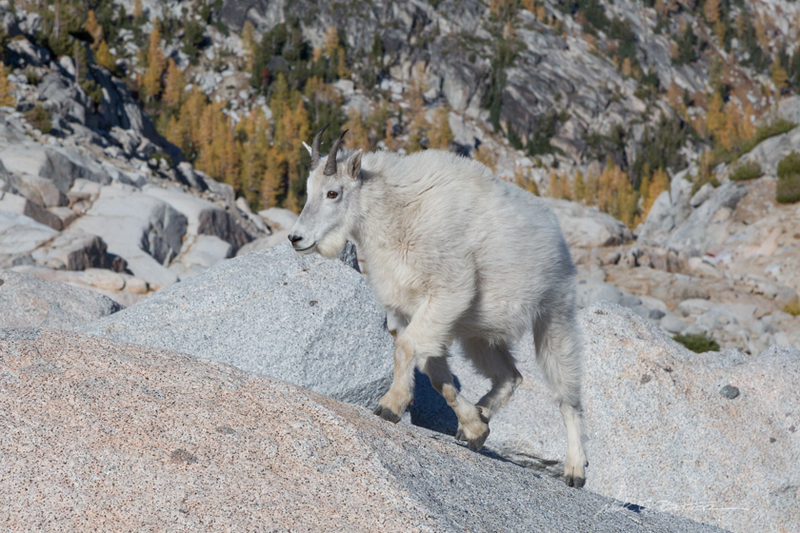 Hopefully, with all this mountain goat knowledge, you will never look at them the same again. 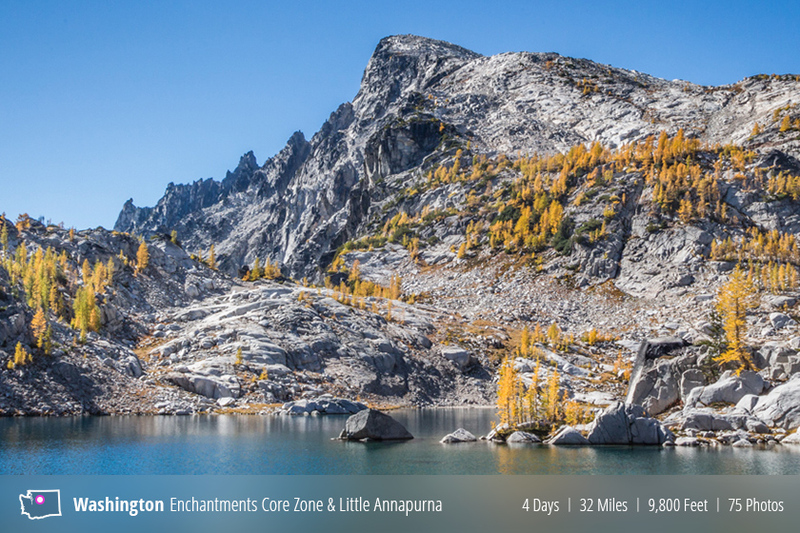 Descending into the Lower Core Zone, we passed by Inspiration lake. And we rounded the corner to meet up with our old friends Prusik and Temple. Let’s talk about these little buggers. Quite a few people warned us about them. Supposedly they have become so accustomed to humans feeding them that they have become quite aggressive with stealing food. One woman told us the chipmunks ate through their food bag and made off with half of their food supply before finding out. 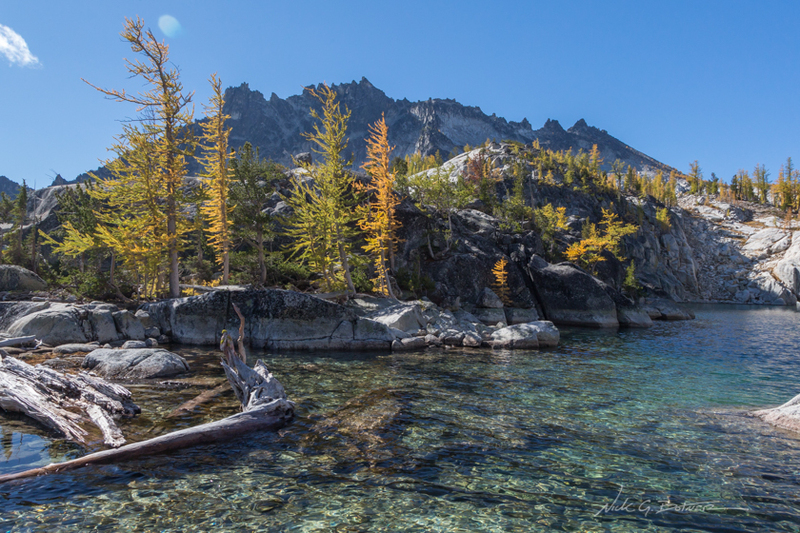 And while our camp was farther away from the more popular areas around Lower Snow Lake, they were still to be seen, and eager to get into our stuff in search of food. And now we are back to Perfection Lake with McClellan in the background. 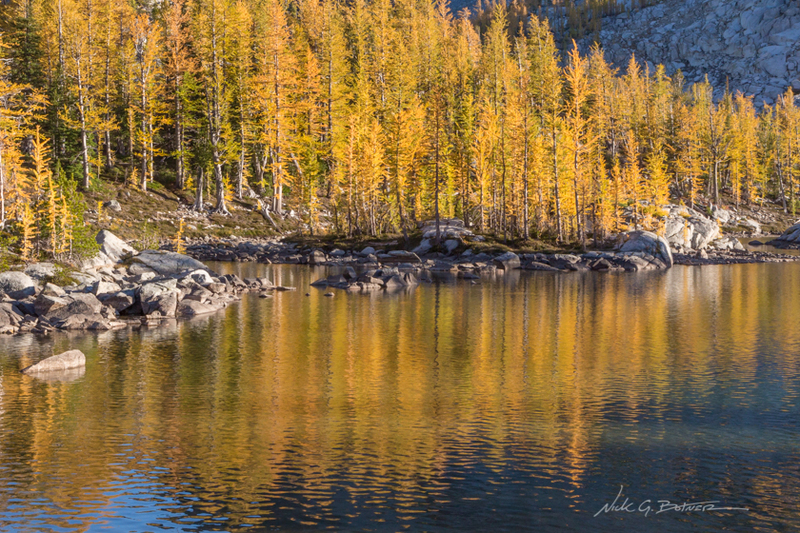 As we made our way around Perfection Lake, the sun was starting to drop. And with that came the golden hour. Looking across Perfection with McClellan in the background. 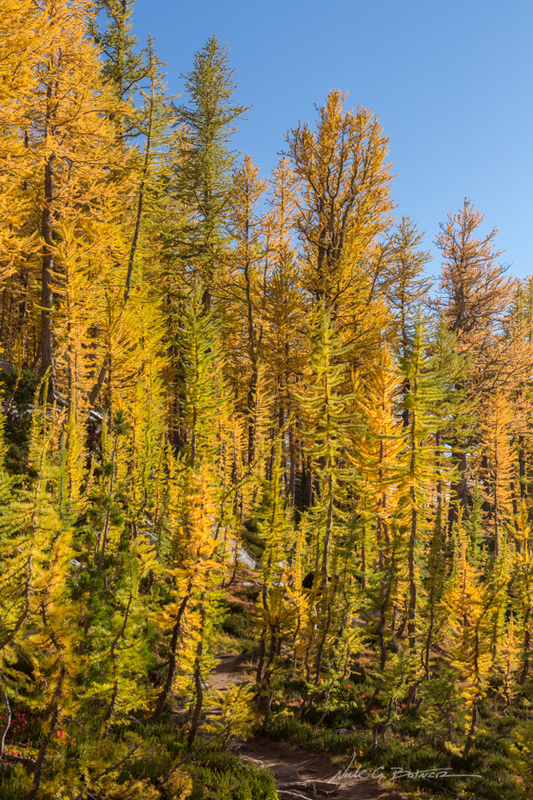 Seeing larches in normal daylight is amazing. Seeing them during a setting sun is beyond comprehension. In fact, I am having a hard time recapturing what they looked like with these photos. I could try to increase the saturation, but it just looks fake. However, when you see them in person, with a setting sun, they seem to almost emit their own soft glowing light. 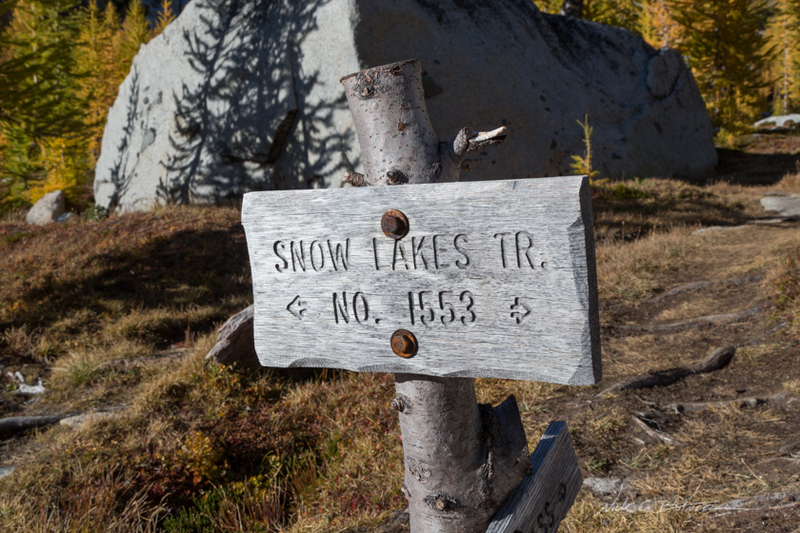 And here is the trail sign for Snow Lakes and Prusik Pass. I don’t know why I took a photo of it. I guess it’s because everyone else ahead of me was and I didn’t want to be left out. 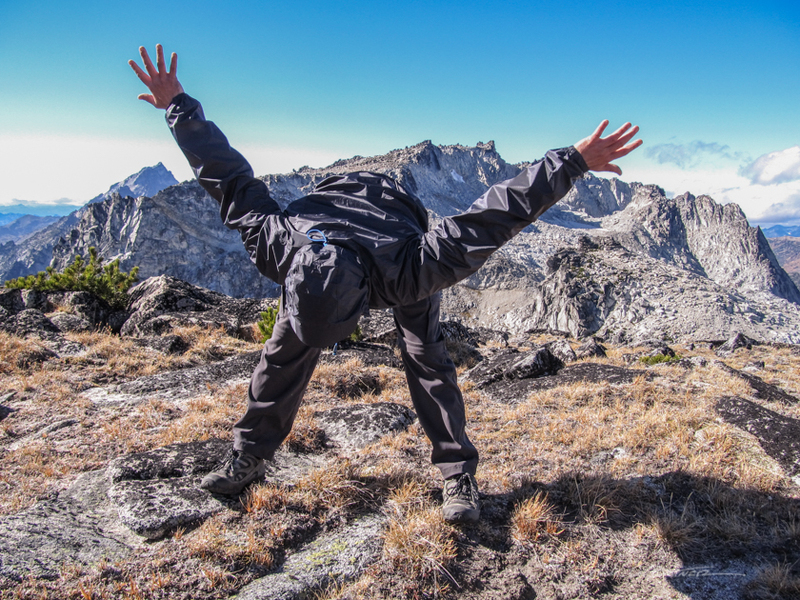 Some people like to climb Prusik Peak with gear. Probably not for me. Little Annapurna peaking over the ridge at Perfection Lake. Must stop taking so many photos! But it’s really hard not to with this light and these surroundings. 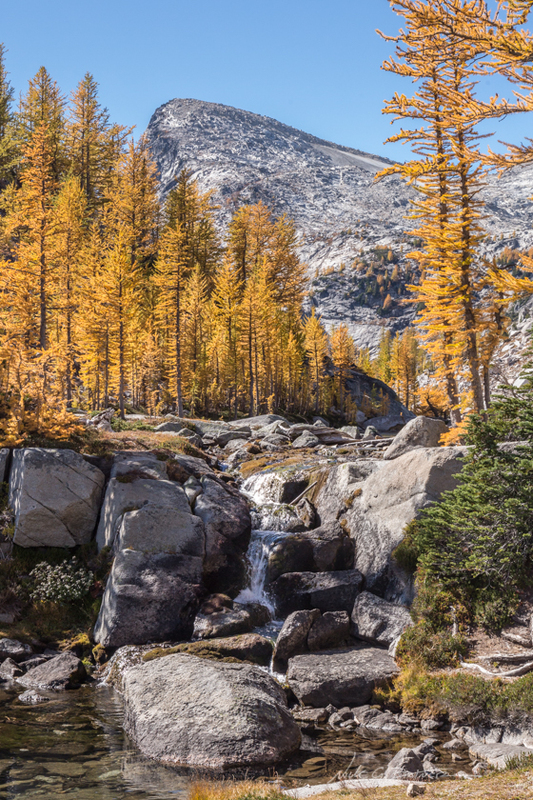 Larches. They will cure all your ailments, even if only momentarily. 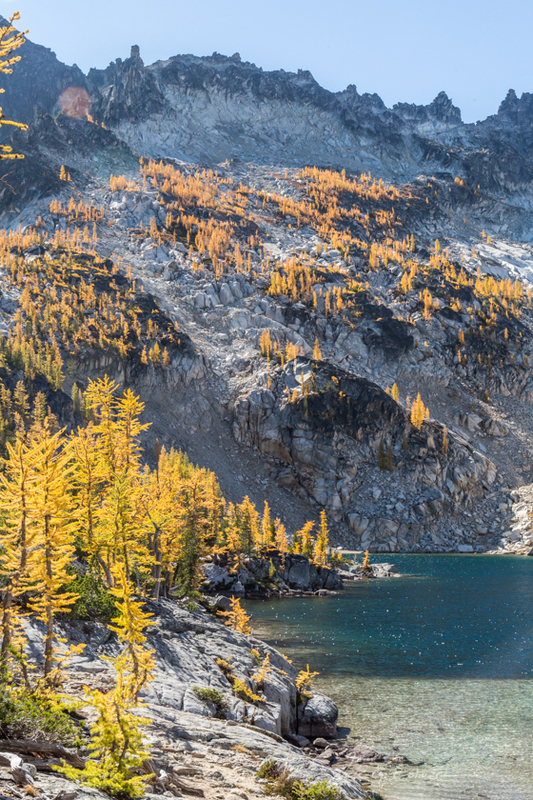 By now we have passed around Perfection Lake and Sprite Lake and are working our way through the larch pass down to Leprecan Lake. Prusik Peak putting on a show with the setting sun. It’s too bad there was a bit of a breeze on the water. Would have been nice to get some colorful reflection shots. 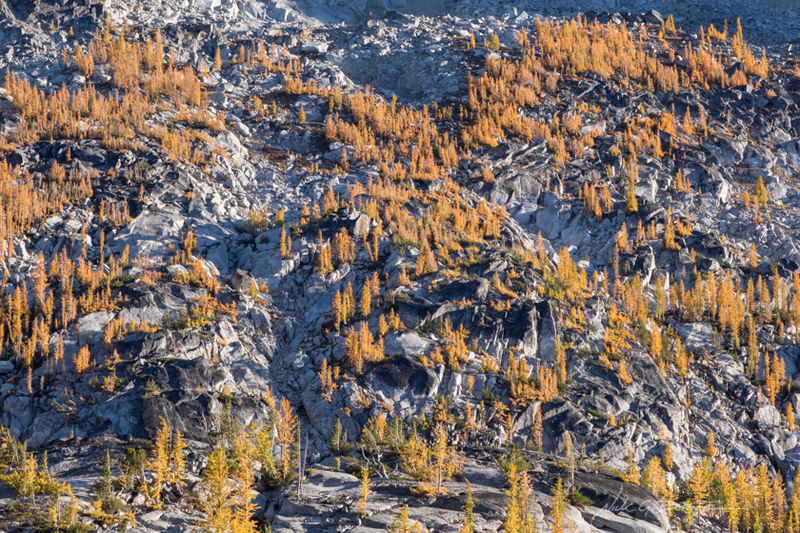 This is the only closeup I got of the larches. I was surprised I had yet to take any, so I grabbed this one just in case. 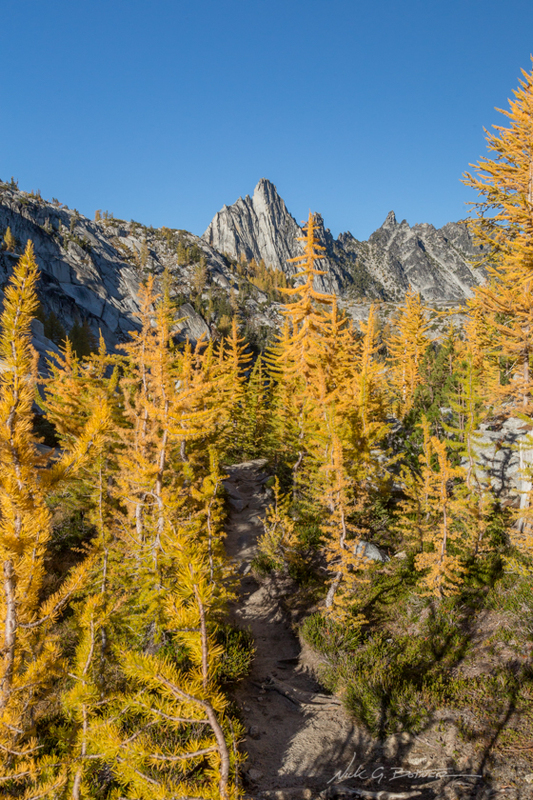 Larches scattered amongst the granite base of McClellan. 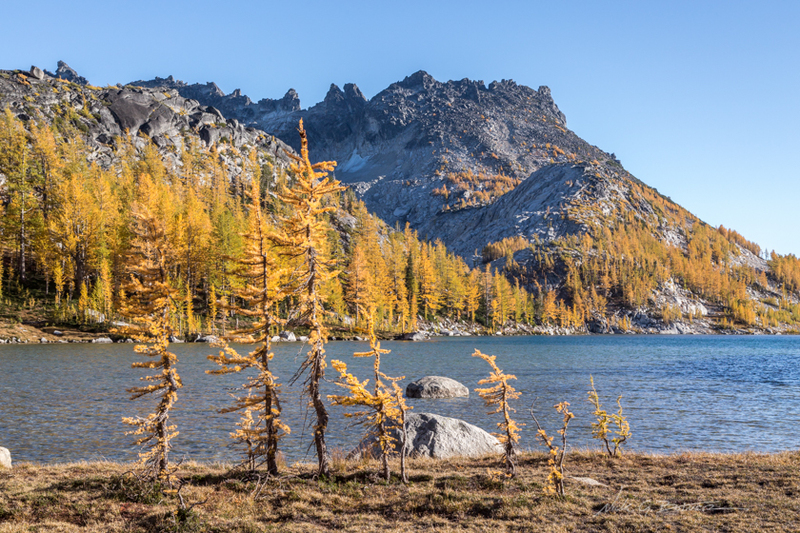 A final shot of the larches before heading back down to camp and into the freezing darkness of night. The next day we awoke to frost on the ground and a cold nip in the air. Or friends who had joined us were the first ones to break camp and make their way back to their car. We stayed a little longer, enjoying an extra cup of coffee and taking our time with breaking the camp and packing our bags. We mentioned to our friends we should meet up in Leavenworth for a brat and a beer. But they were so far ahead of us that by the time we got to the car, they were already back in Seattle. Our hike down the mountain was a slow one. Our Florida friend was nursing his over-used muscle and to be honest, I didn’t care. I mean I cared about his injury, but I didn’t care that the pace was slow. I took the extra time to really soak things in and just enjoy the magnificent surroundings. There was one point where we were blocked on the trail by a couple momma goats and their babies. With the goats blocking the way out. I picked up a very large stick (probably a small tree) and shooed them off the trail with threatening gestures and sounds. The goats didn’t want any piece of me and they promptly stopped their blockade and headed for higher ground. I bet they were more weirded out than threatened by me. By the time we got back to the car, it was mid afternoon. It took us a little over five hours to make our way down. And that was just from going at a slow pace with little tiny breaks every now and then. Thankfully, once we got all cleaned up and changed into fresh clothes, they were still serving hot brats and ice cold beer back in Leavenworth. And, as promised, here are a couple maps of our route and the scramble in a bit more detail. 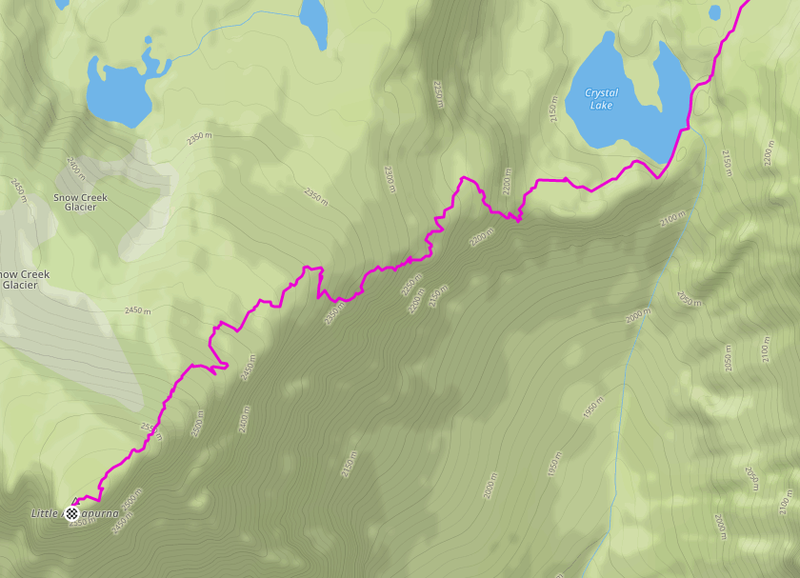 The full hike, with return loop from Little Annapurna in darker purple. 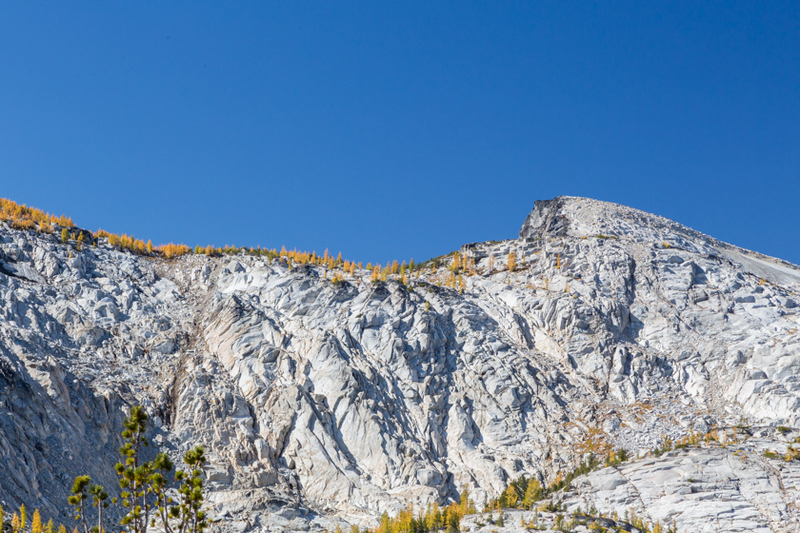 Closeup of the Little Annapurna scramble. 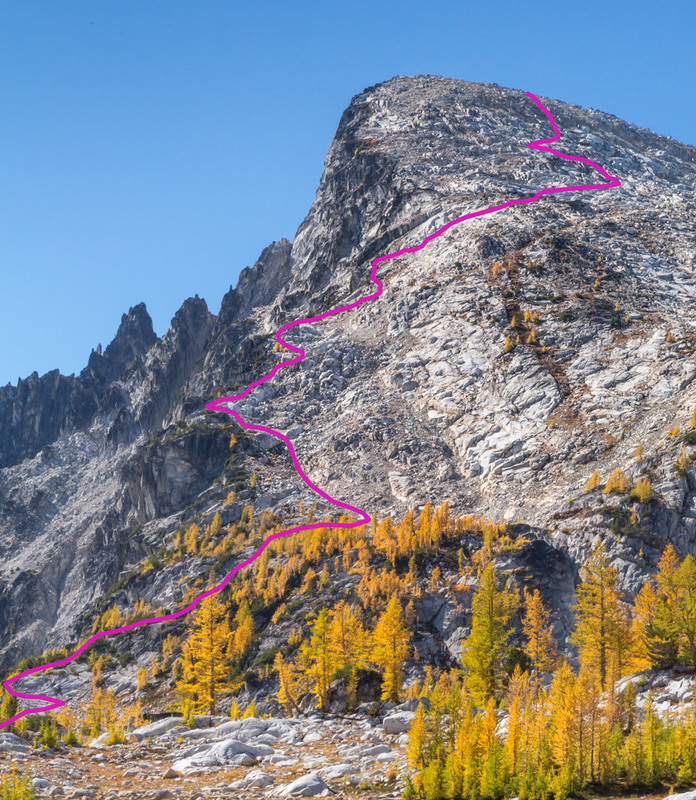 And here is our scramble route outlined against one of my photos. 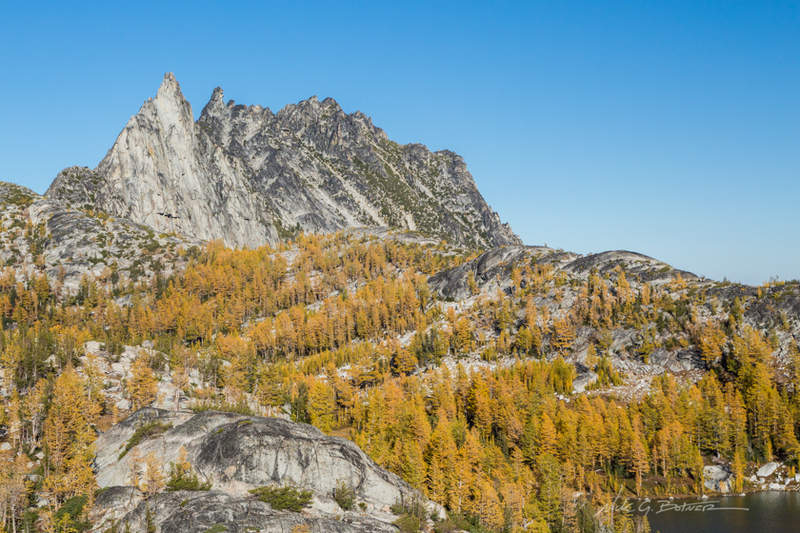 Another trip into the Enchantments and another summit logged. 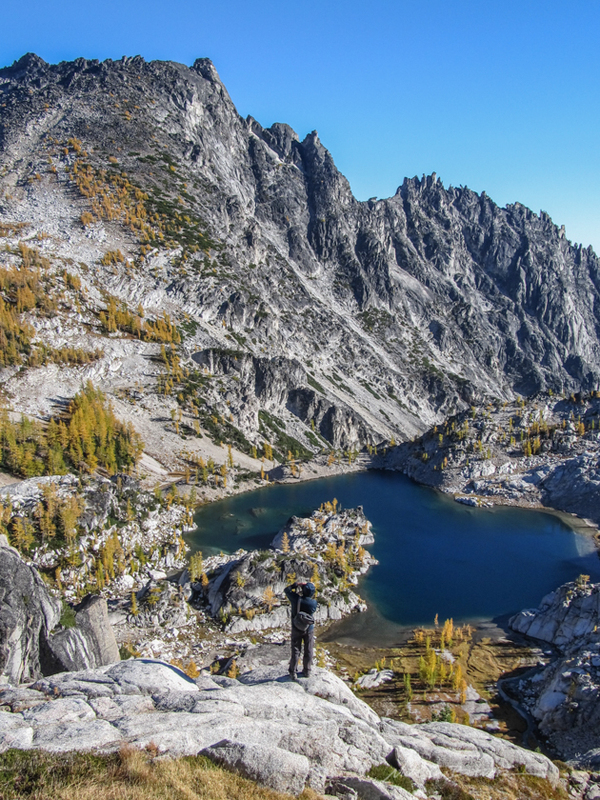 A lot of people think this is an overwhelming hike. 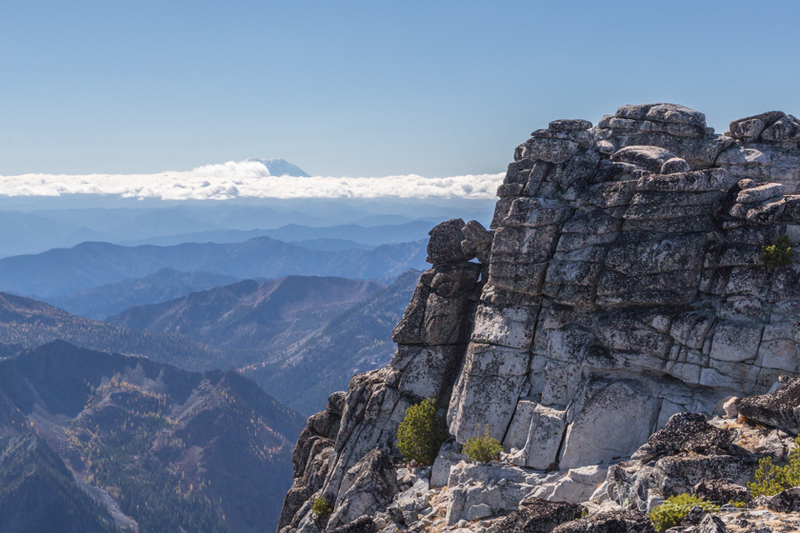 But if you spend some time outside and get a few decent hikes under your belt, this is a piece of cake. Hell, even our friend from Florida made it all the way up Little Annapurna. Of course he sustained a small injury from not training at all. 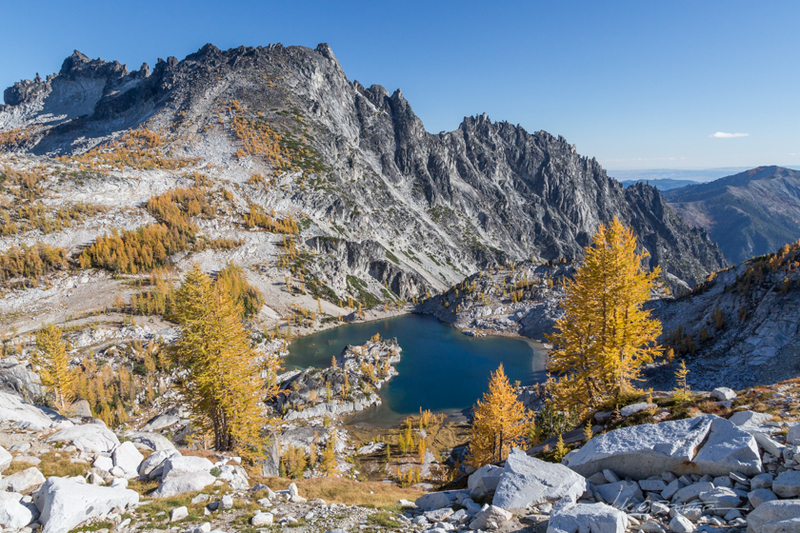 But the point is is that you too can make it up there and enjoy the absolute best hiking Washington has to offer…as long as you put your mind to it. 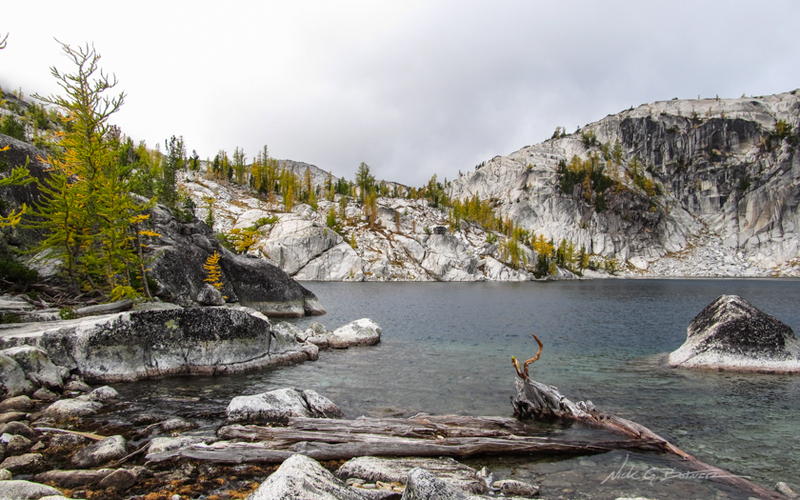 Oh, and winning the Enchantments lottery, because you can’t do any camping unless you get that permit. Looking forward to next year! Maybe we can check off McClellan and Dragontail.